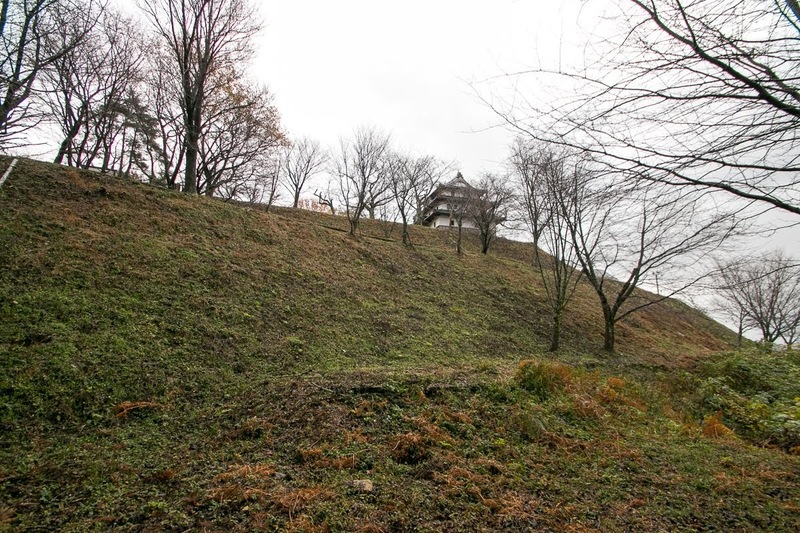 Ueshi castle (羽衣石城) is located at the top of Ueshiyama mountain, one of 370 meter above sea level at the middle of Tottori prefecture. 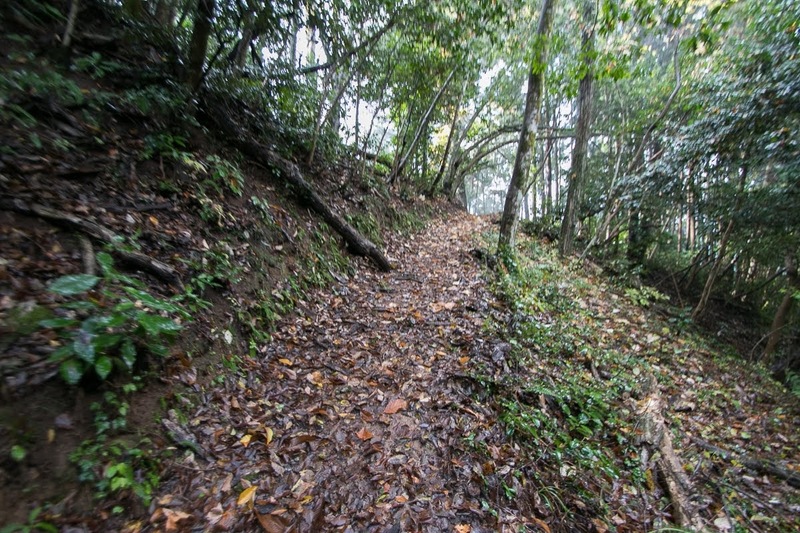 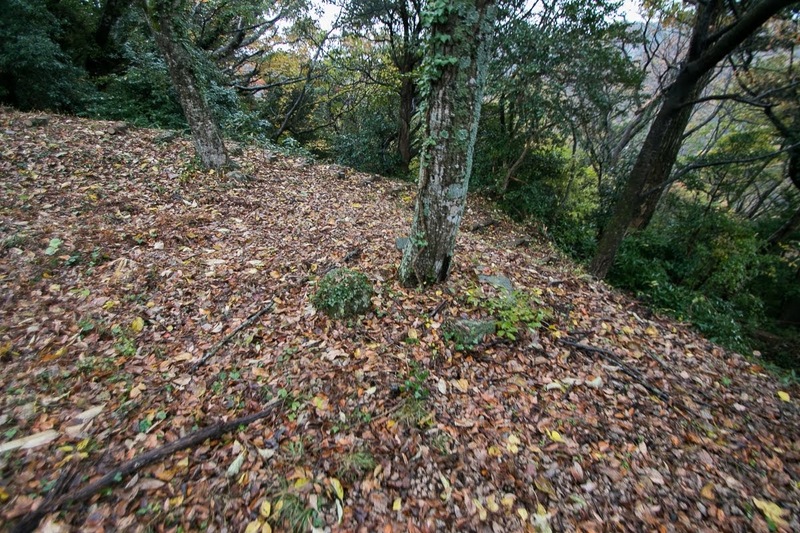 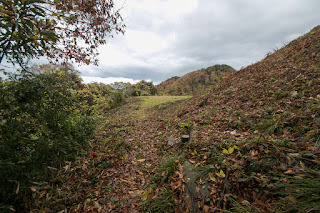 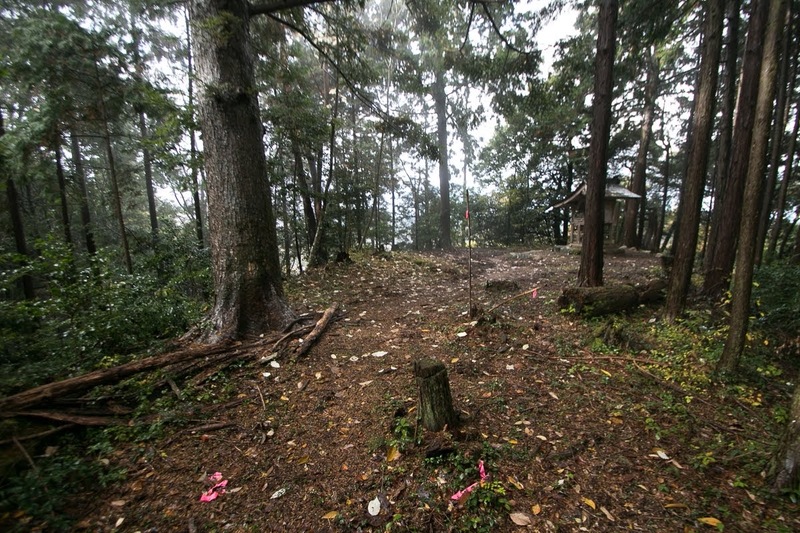 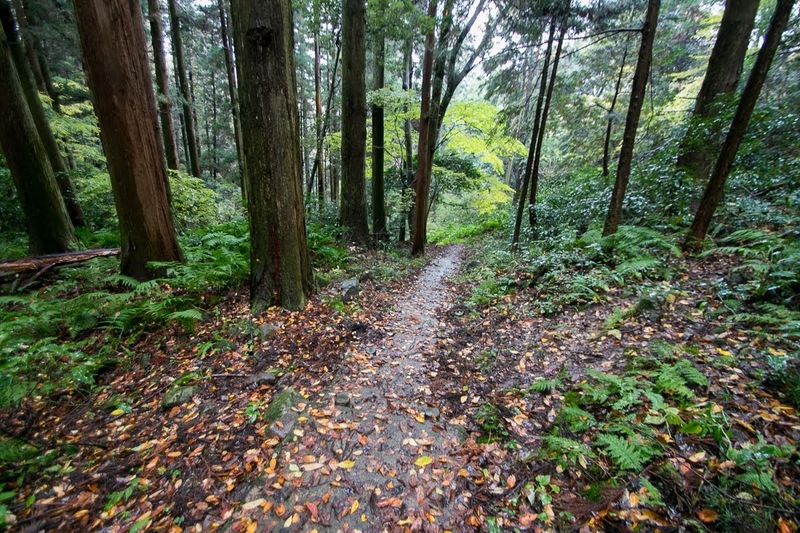 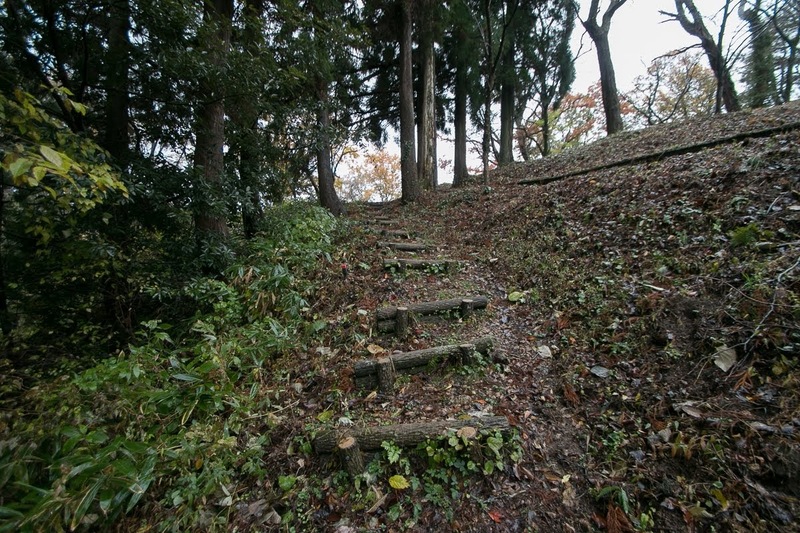 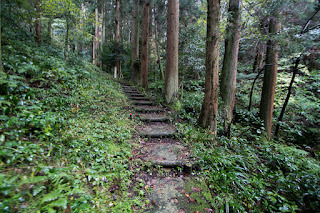 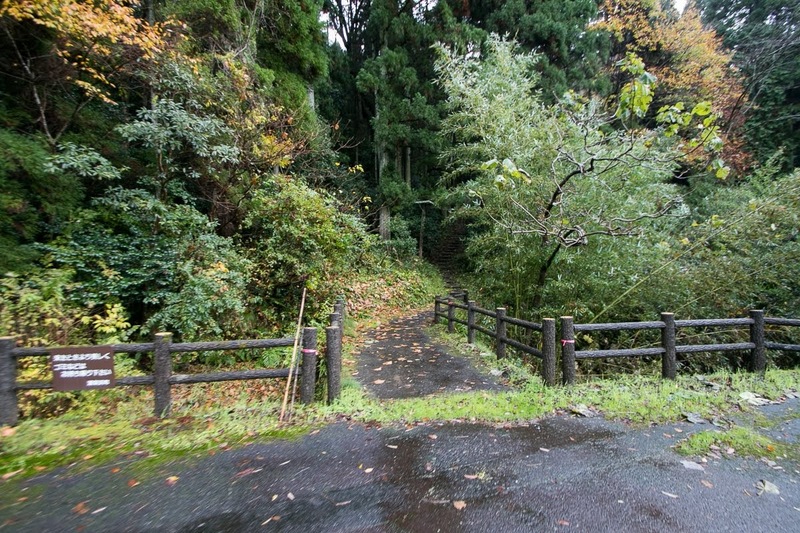 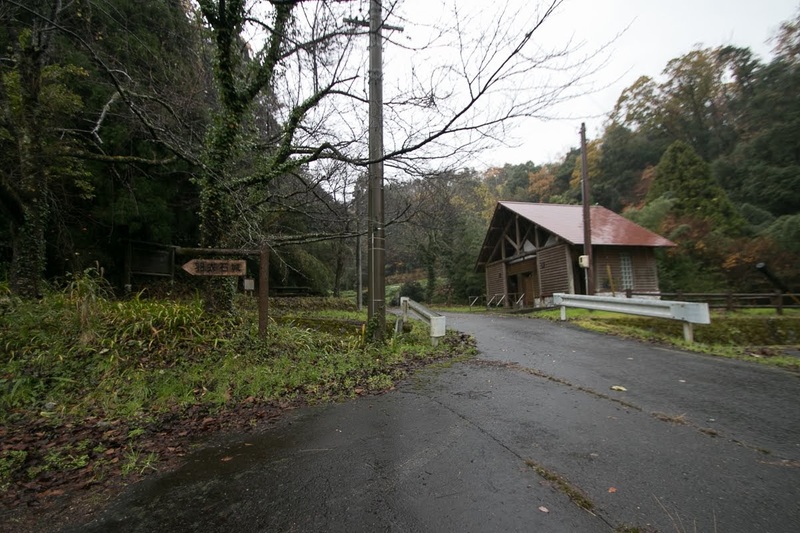 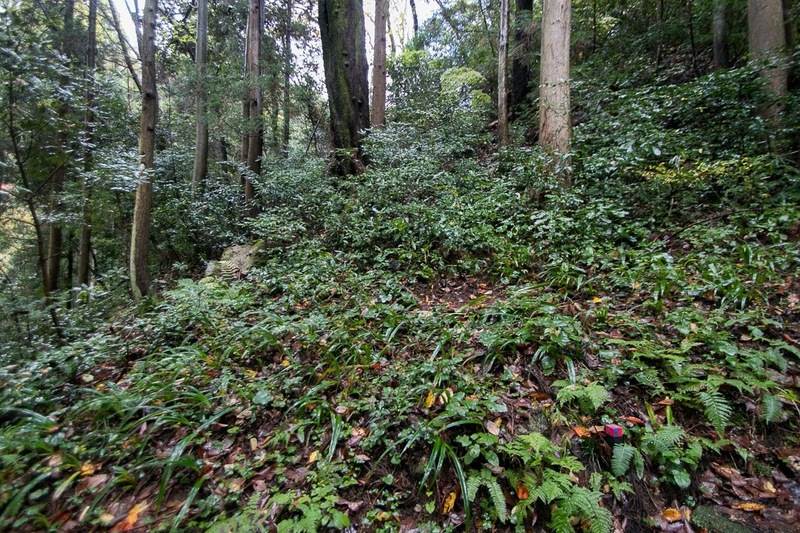 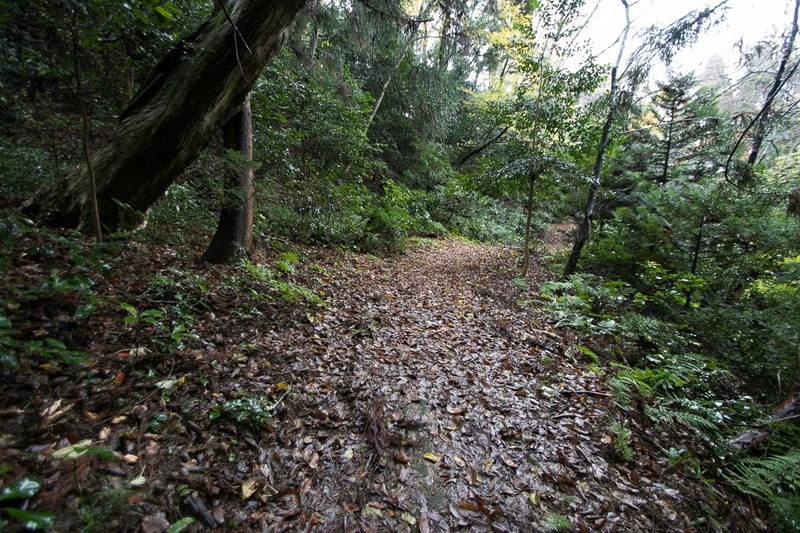 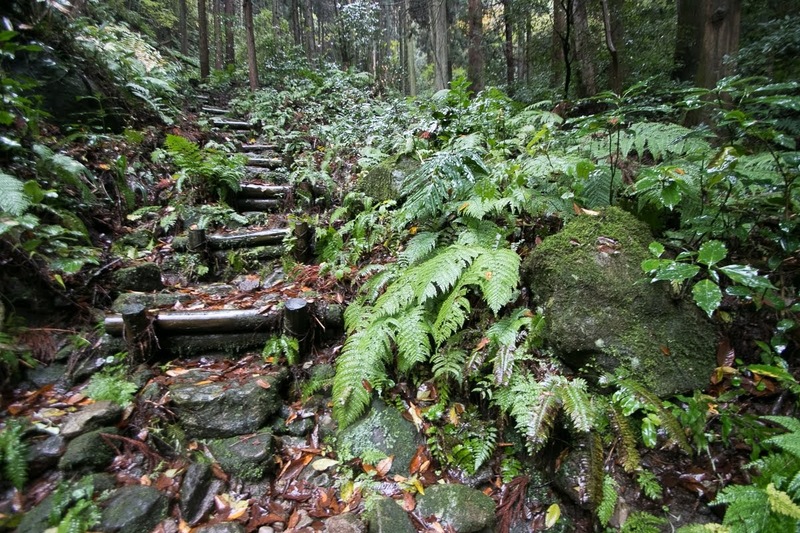 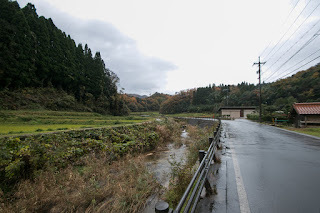 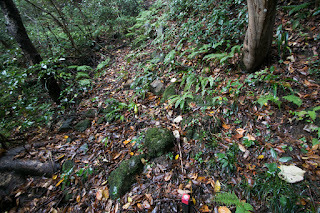 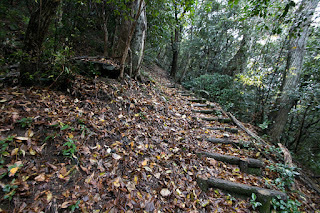 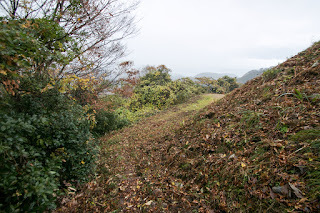 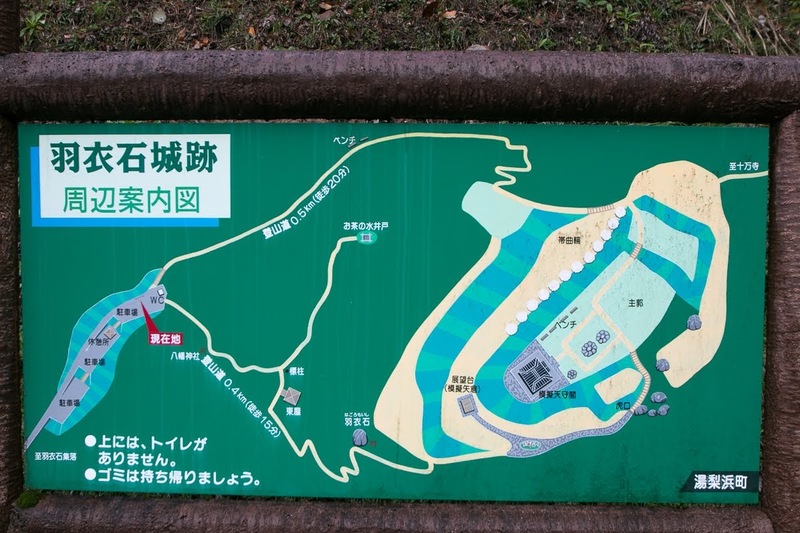 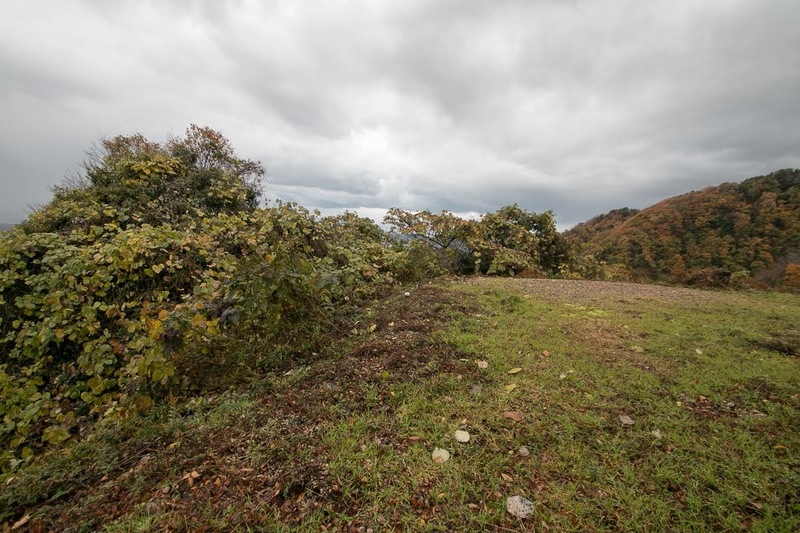 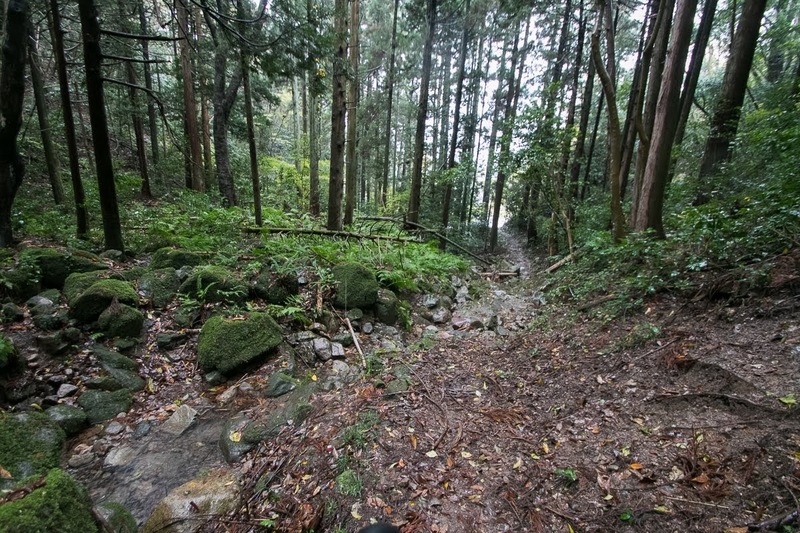 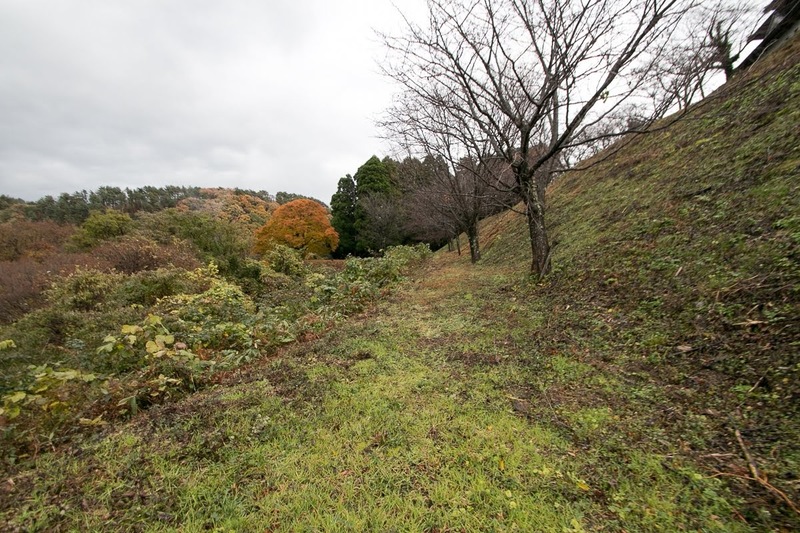 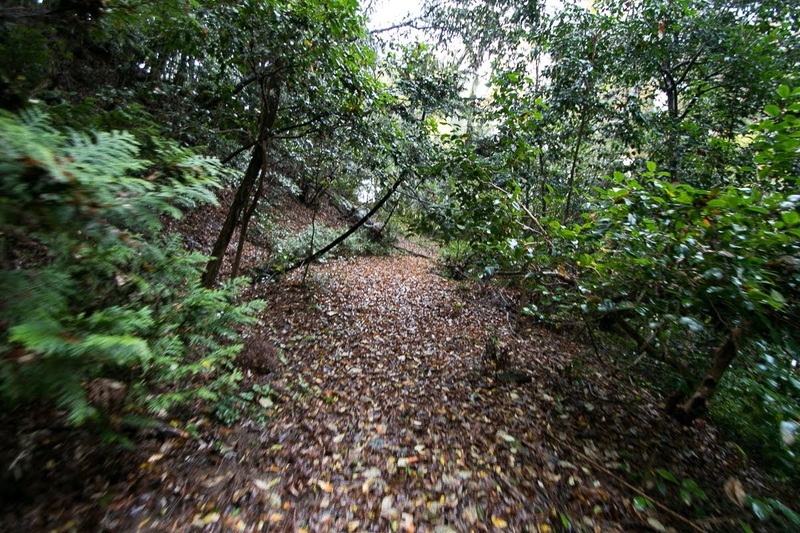 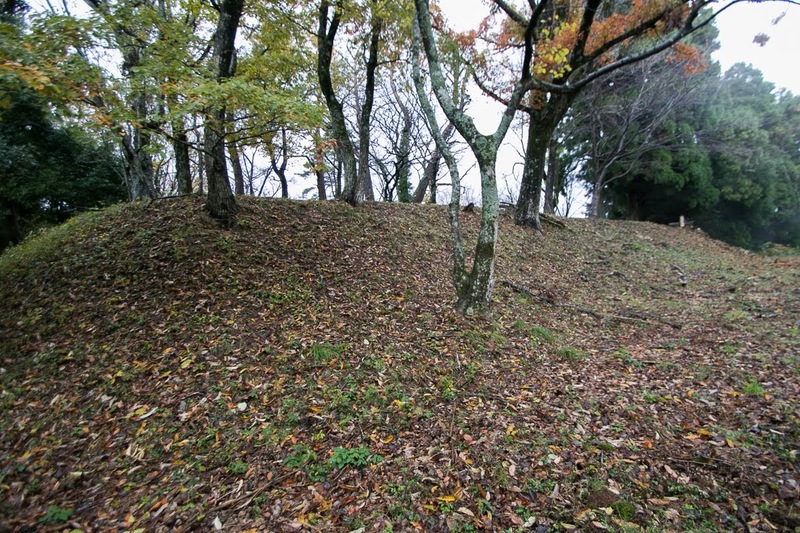 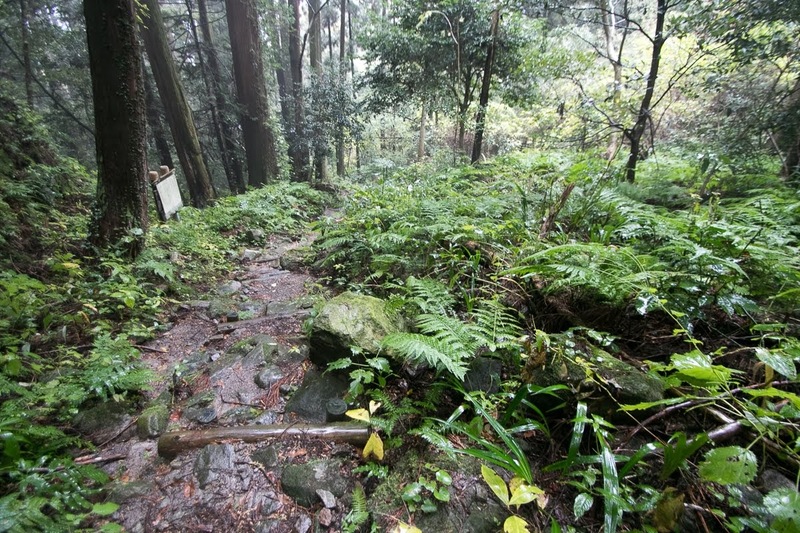 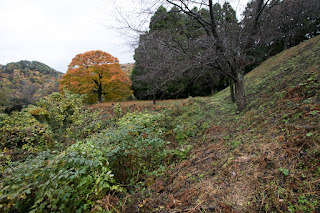 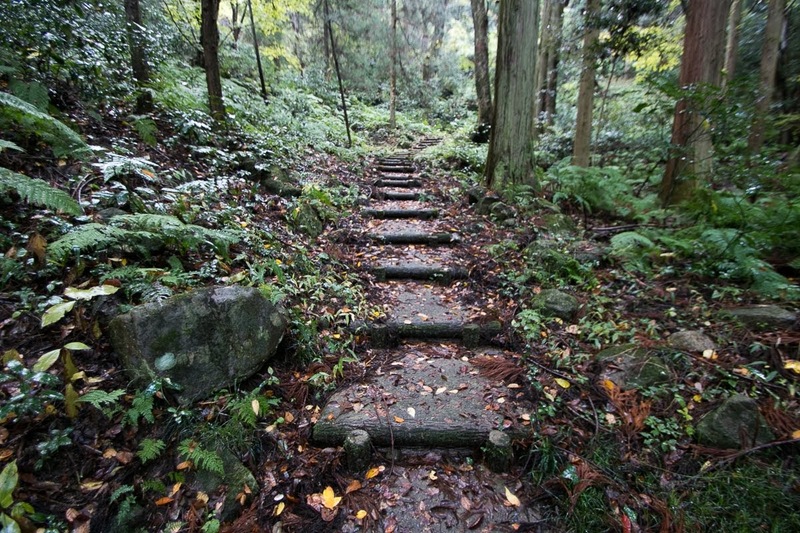 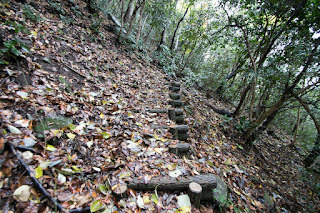 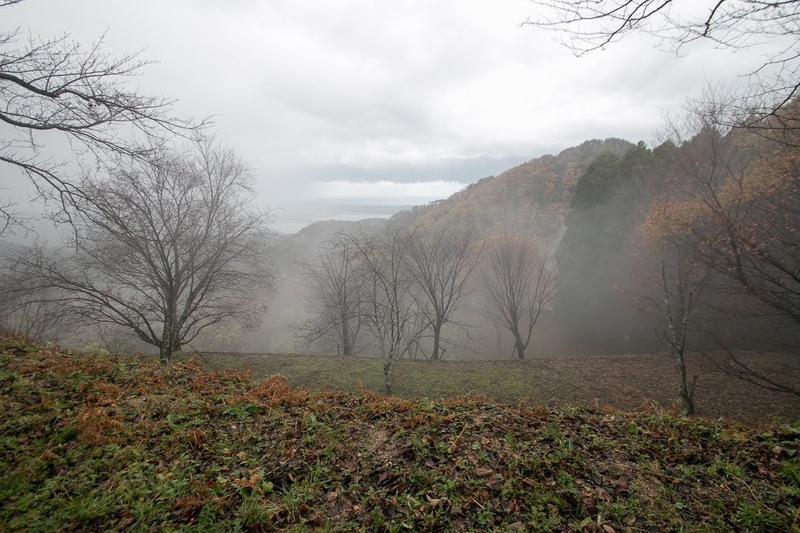 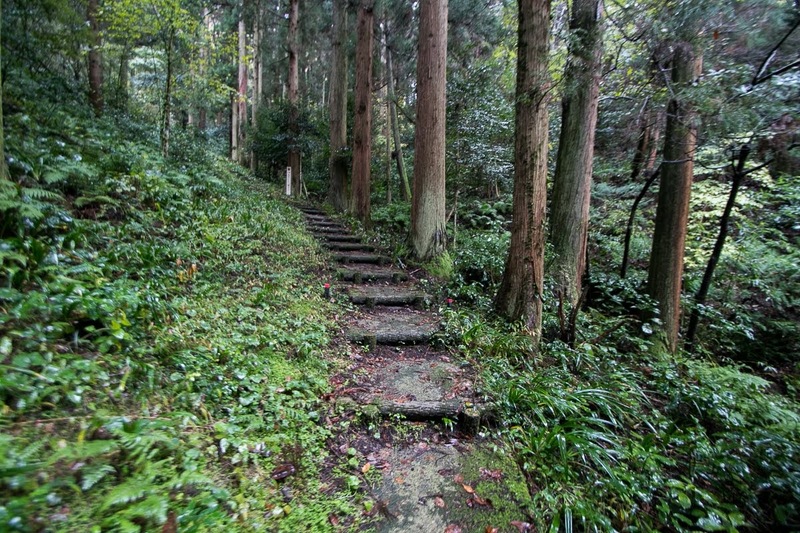 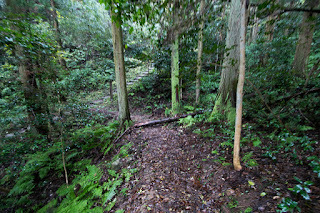 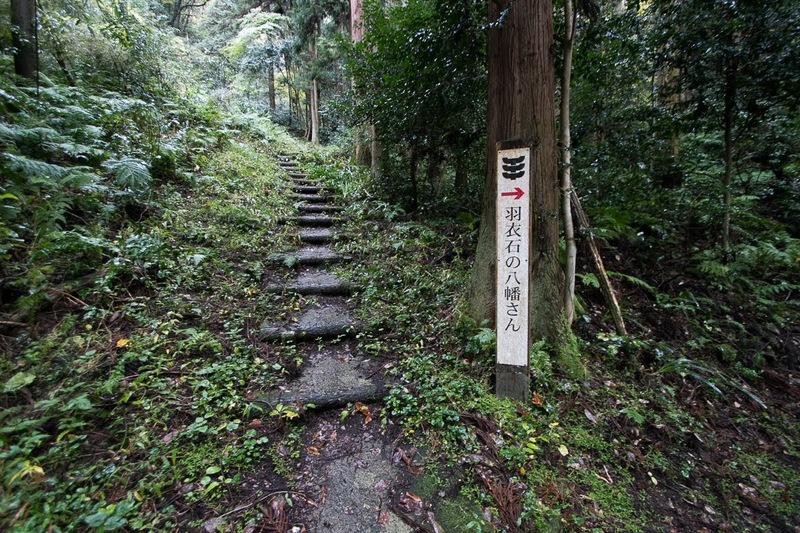 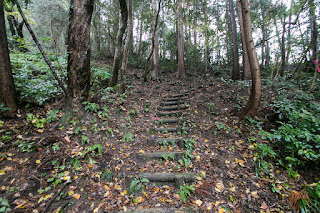 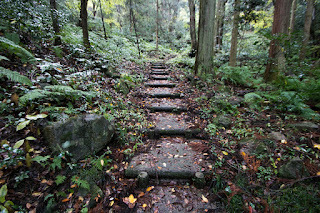 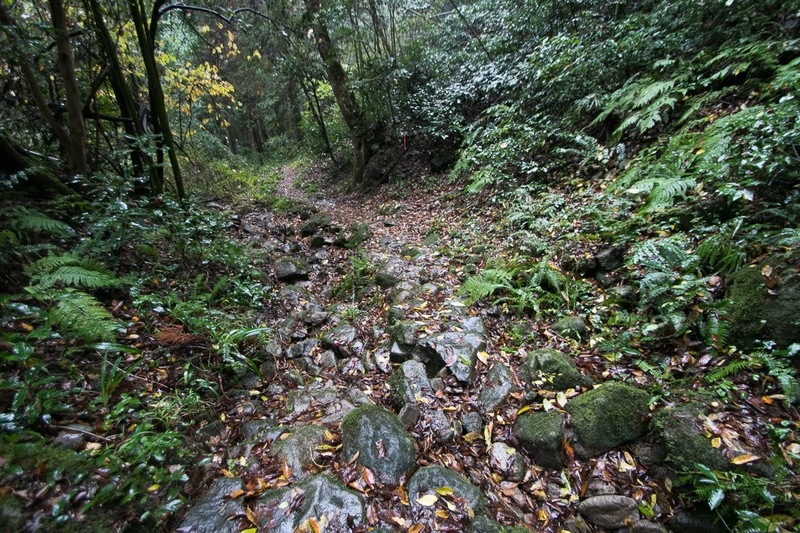 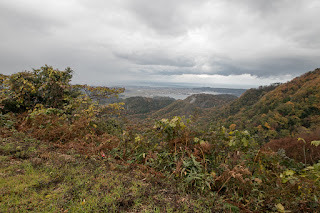 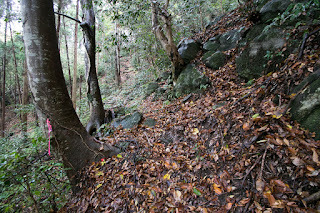 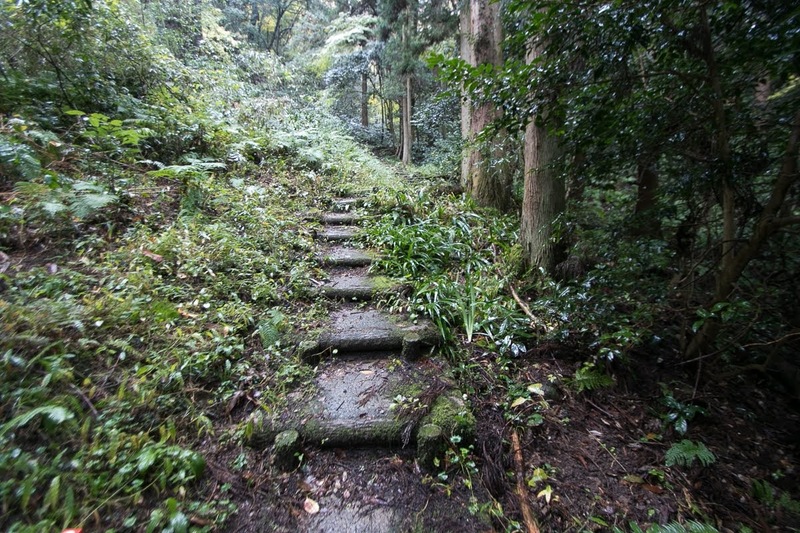 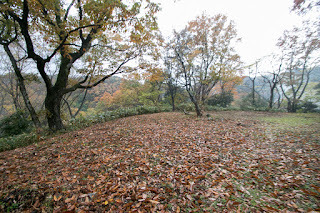 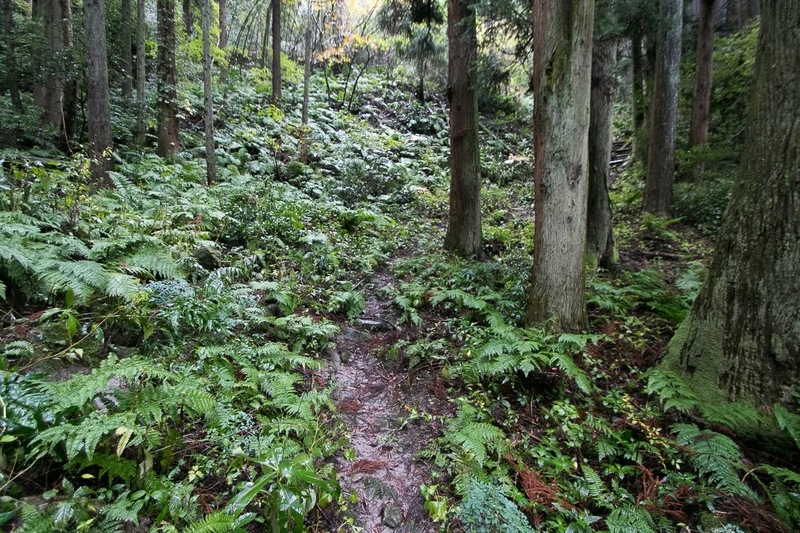 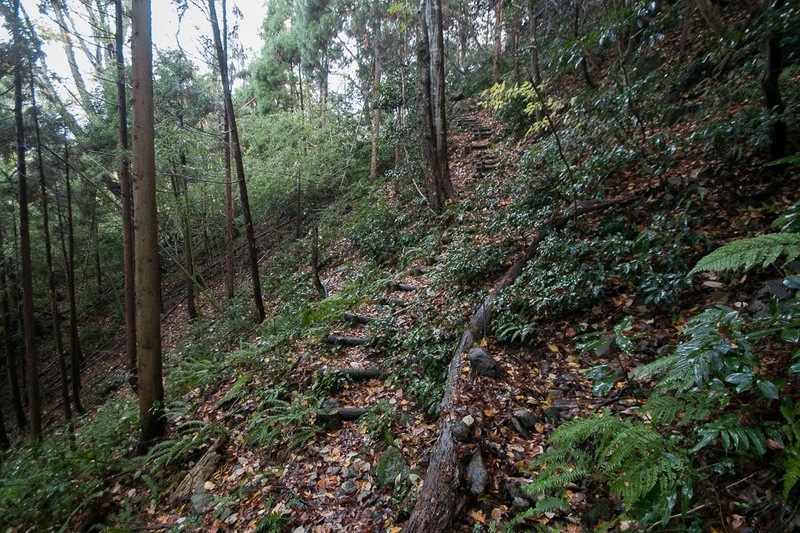 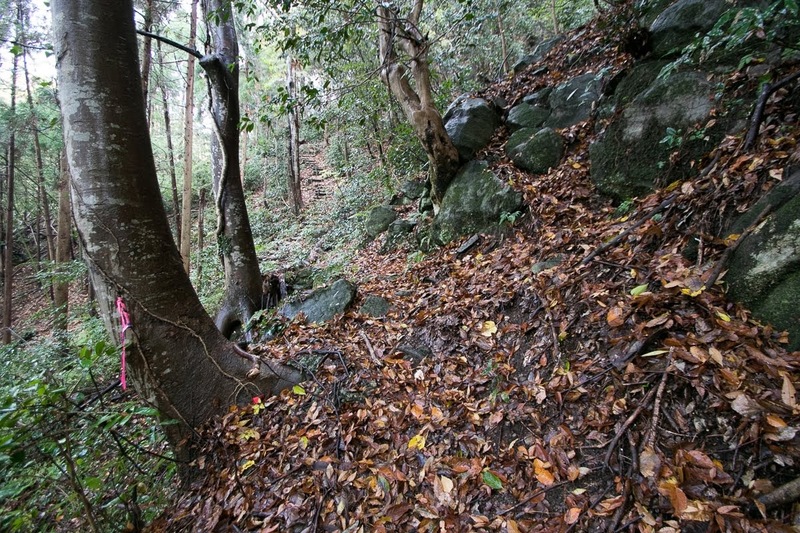 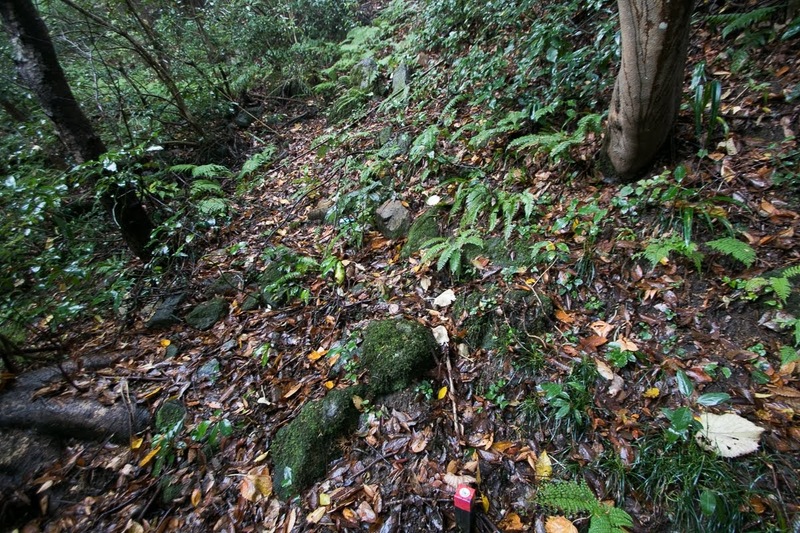 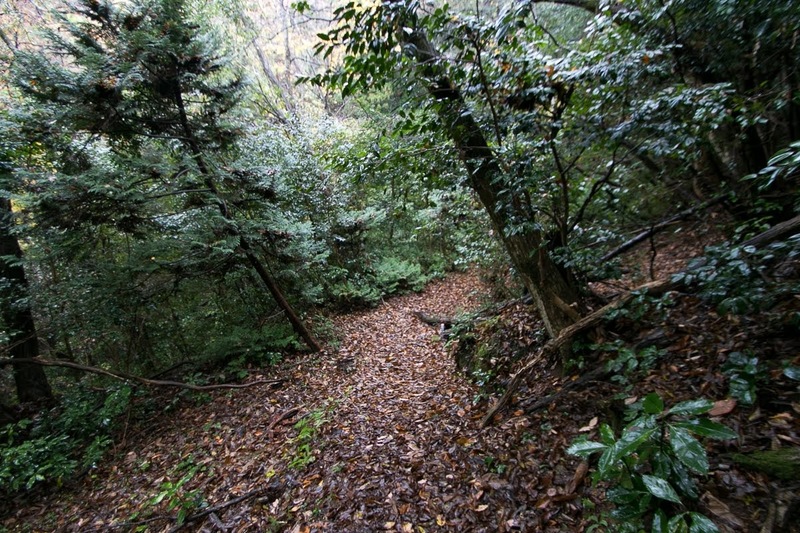 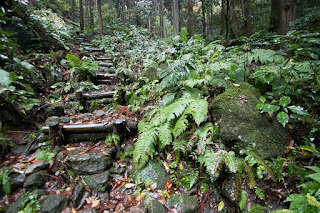 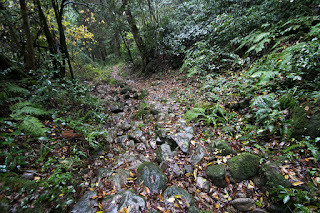 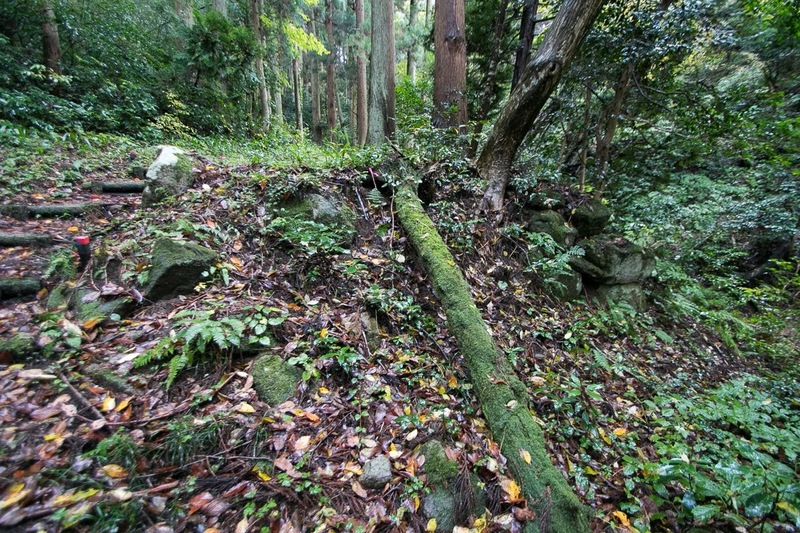 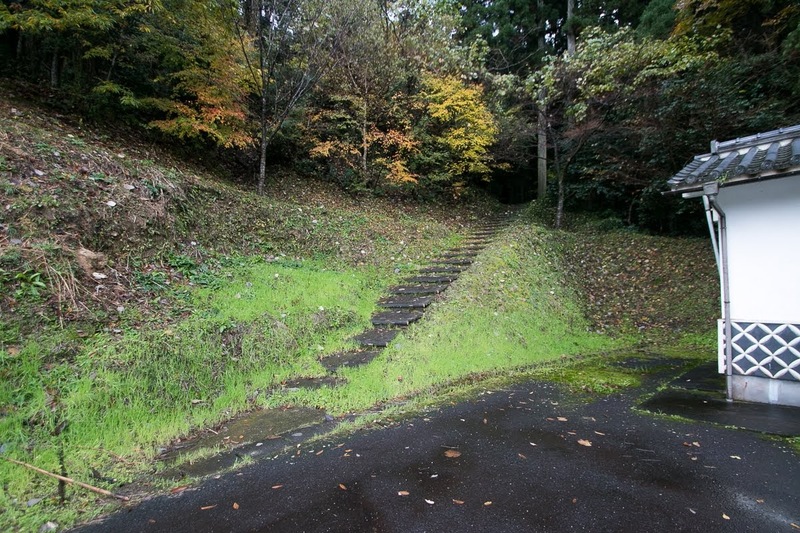 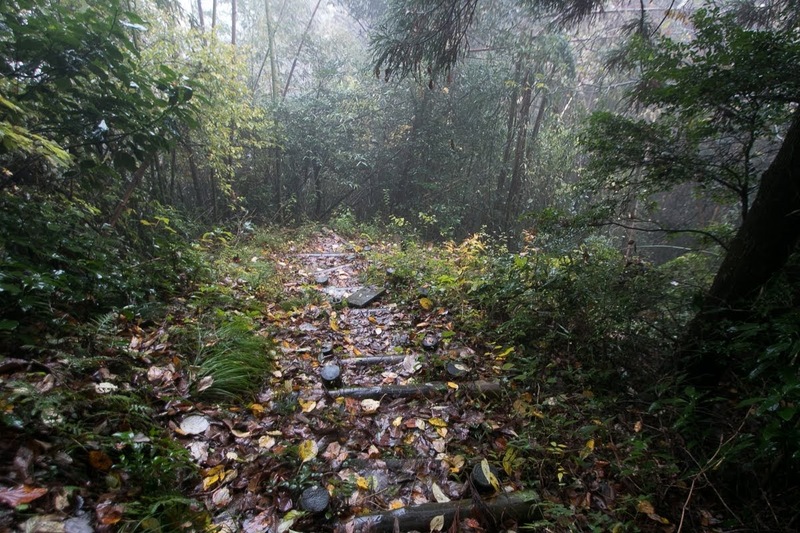 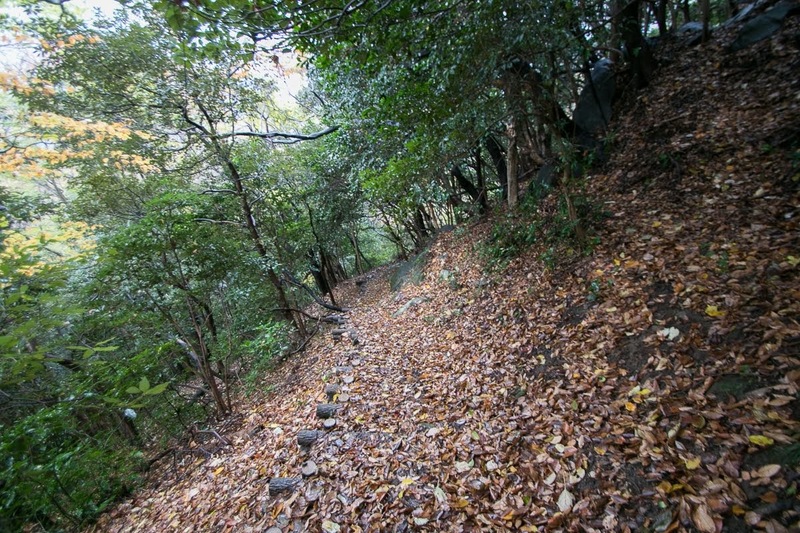 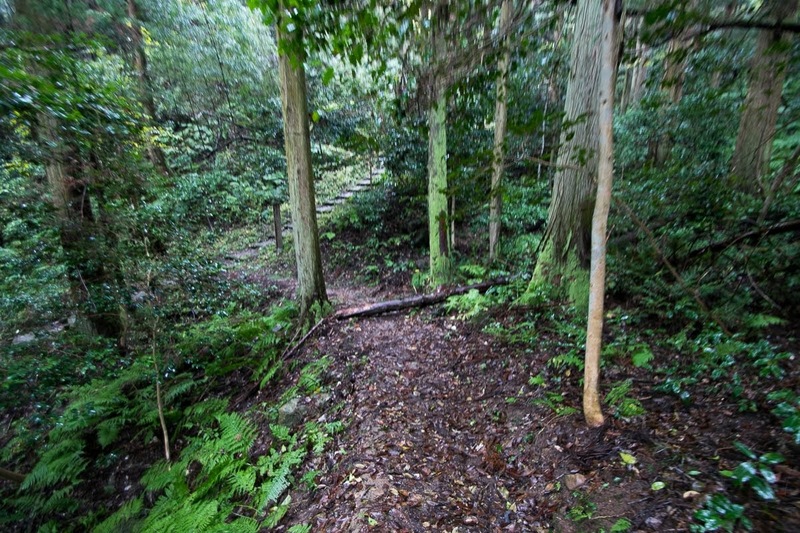 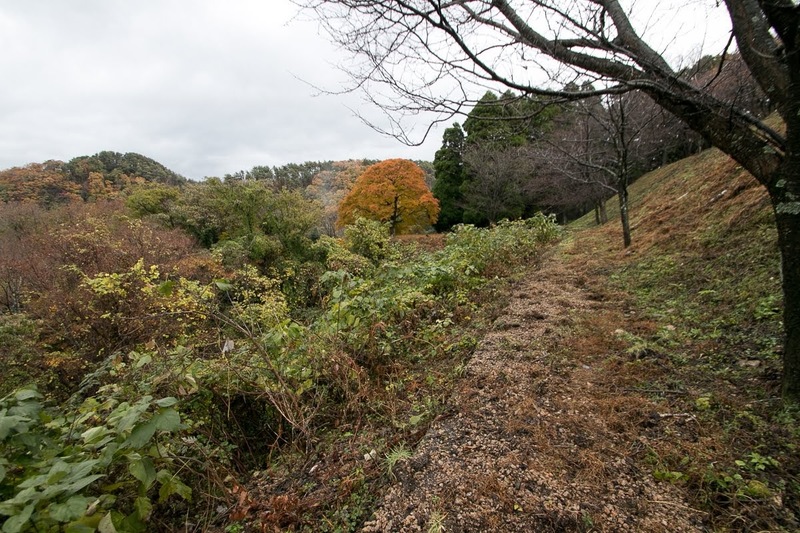 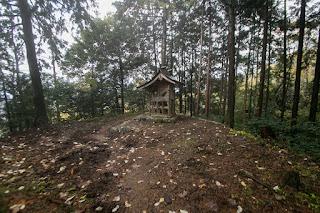 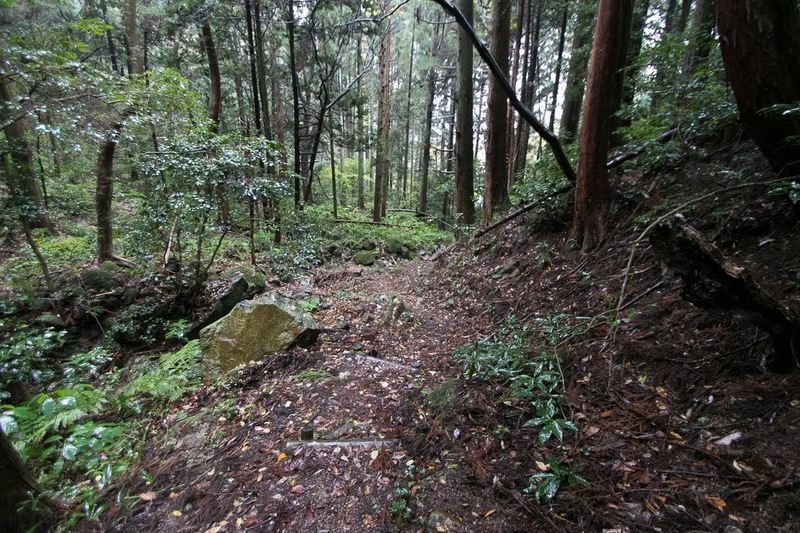 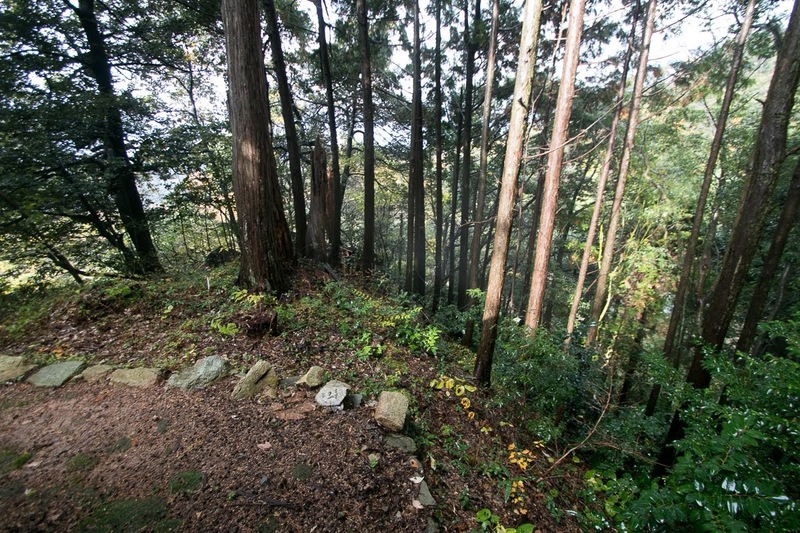 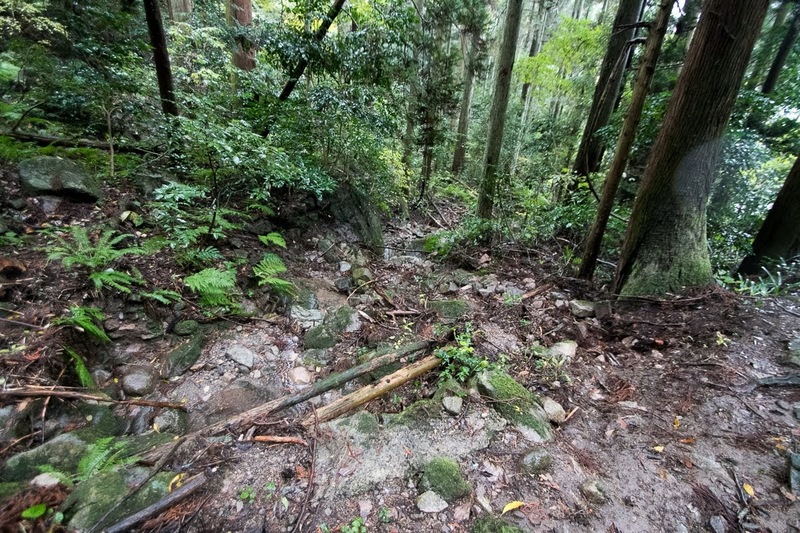 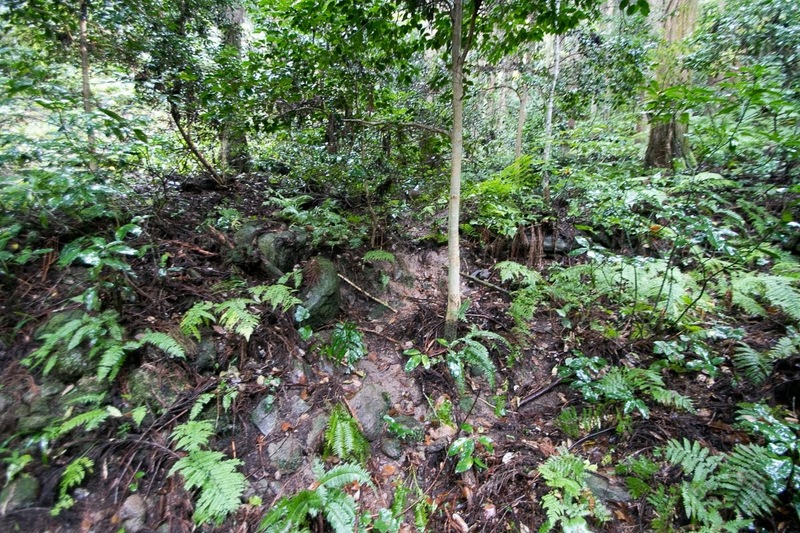 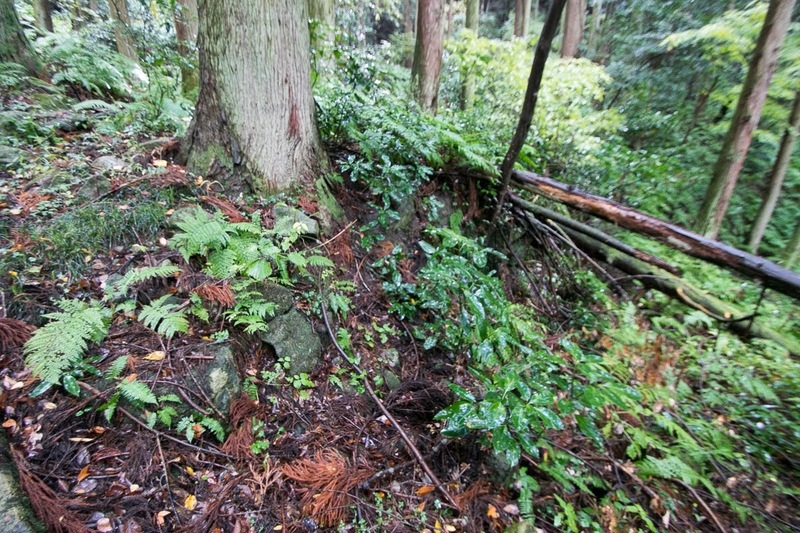 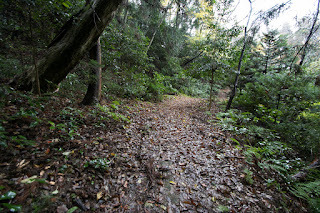 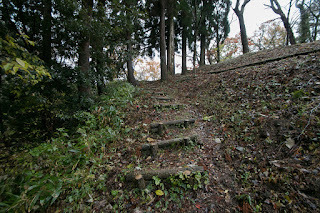 The site of the castle is the upstream of Ueshi river, and ahead of 2 kilometer narrow valley from Lake Togoike. 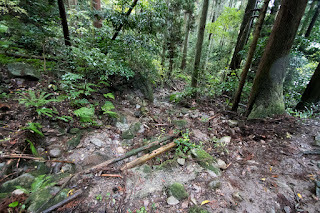 Being surrounded by steep mountains and deep valley, even though not convenient but it is suitable place for defense. At 2 kilometer south of the castle ahead of mountain, there is famous Misasaonsen Spa known for its radium spa and which has over 850 years history. 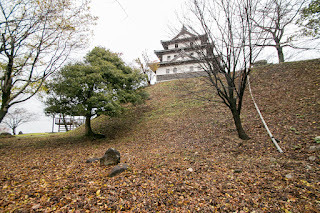 Ueshi castle was built by Nanjo clan as their residence in 1366. Nanjo clan is said as a descendant of Enya clan, which became the governor of Izumo province and Oki province (Shimane prefecture) at the establishment of Muromachi Shogunate but was subjugated by a suspect of rebellion. 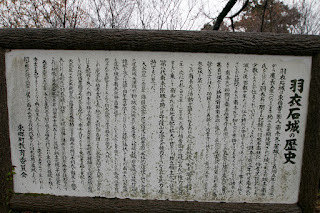 But it is also said that there was already Nanjo clan before this era, and the origin of Nanjo clan is still ambiguous. 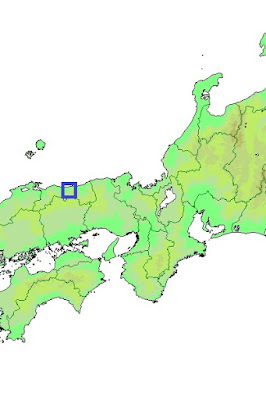 Nanjo clan grew its power throughout Muromachi era. The governor of Houki province (western half of Tottori prefecture) was Yamana clan, along with Inaba province (eastern half of Tottori prefecture) and Tajima province (north part of Hyogo prefecture). 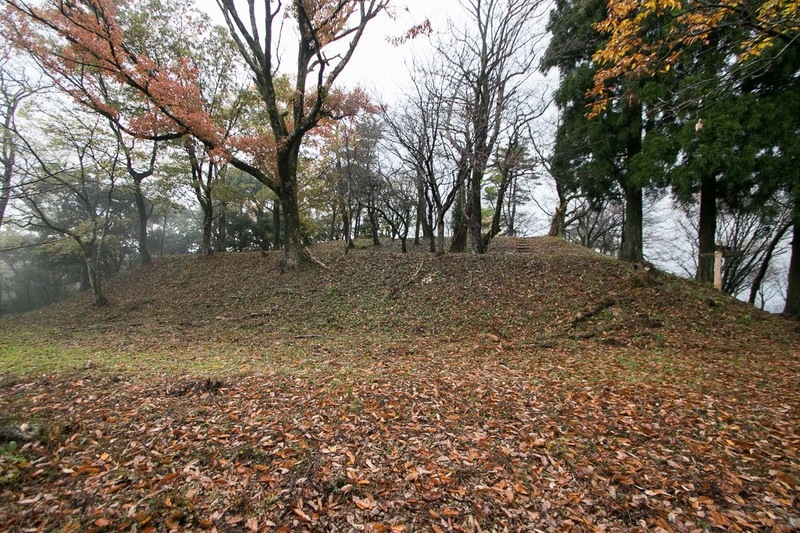 Yamana clan was one of the largest retainer of Muromachi Shogunate which held Sanin region, but at the time of Onin no Ran (1467-1477). 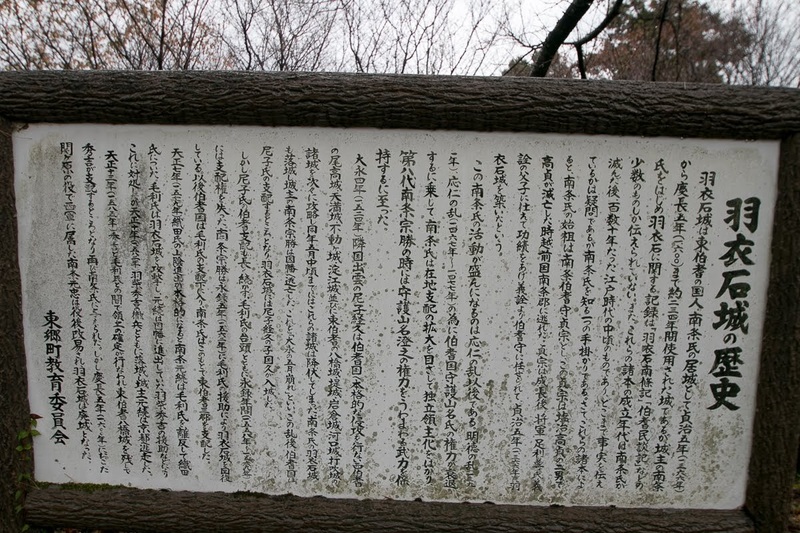 the largest internal conflict at Muromachi era, Souzen Yamana (1404-1473) became the leader of one side but could not make achievement and lost its authority. At the beginning of 16th century, strong local lords such as Nanjo clan, Ogamo clan or Yukimatsu clan resisted to Yamana clan which lost the power and became virtually independent. 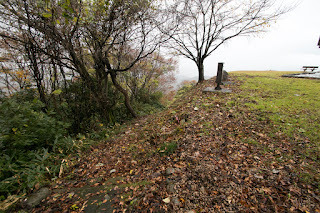 But in 1520's, Tsunehisa Amago (1458-1541) who rose up to the governor of Izumo province (eastern part of Shimane prefecture) intruded into confused Houki province. 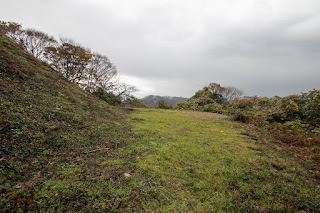 This incident is called as "Daiei no Gogatsukuzure" (a lightning invasion at Daiei period) in which whole Inaba province was captured in one month, but recently it is said that it was rather than long continuous battle between Amago clan and local lords of Inaba province. 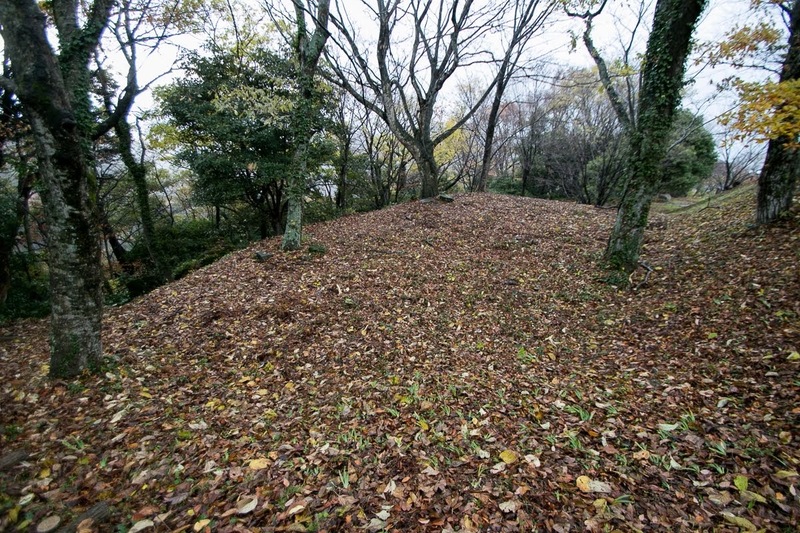 Anyway at last Nanjo clan once lost Ueshi castle by Amago clan and wandered. 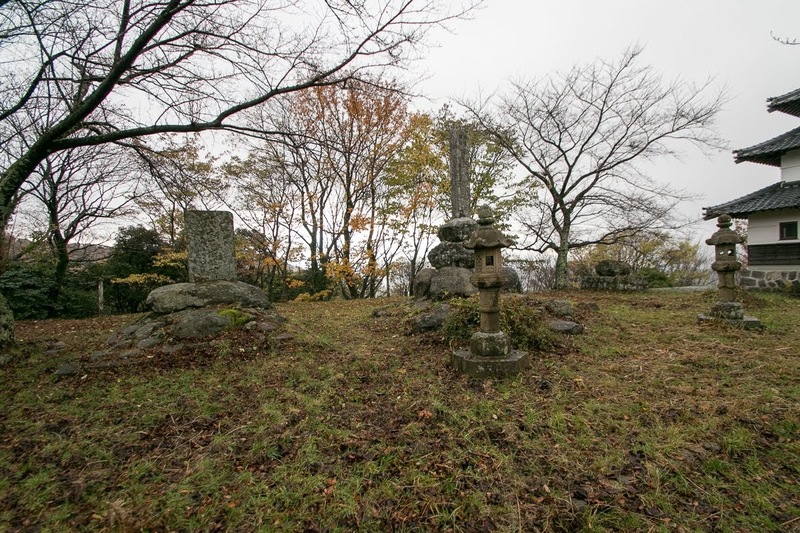 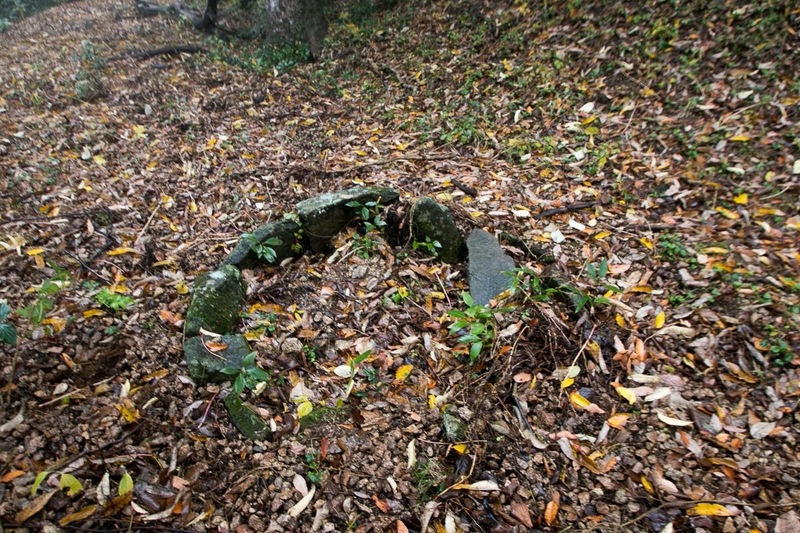 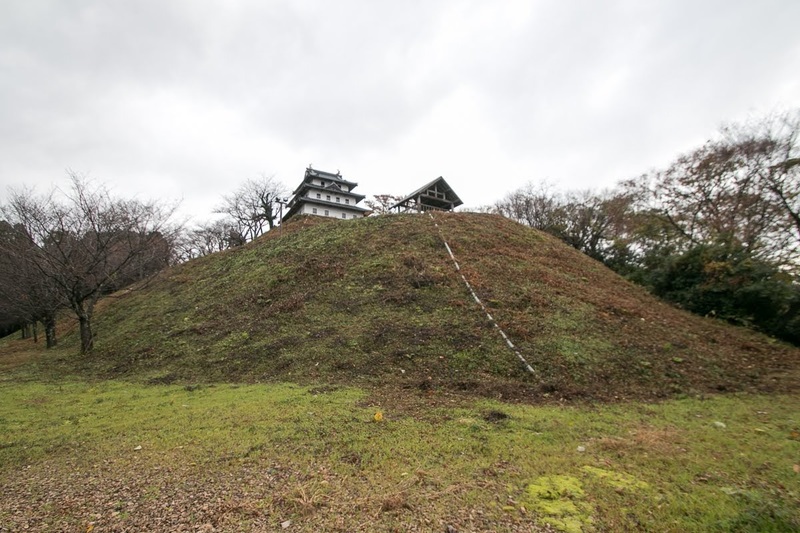 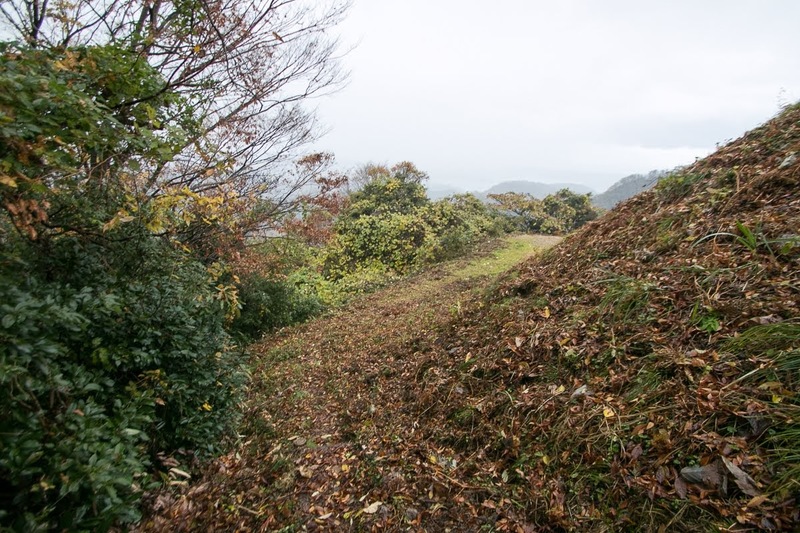 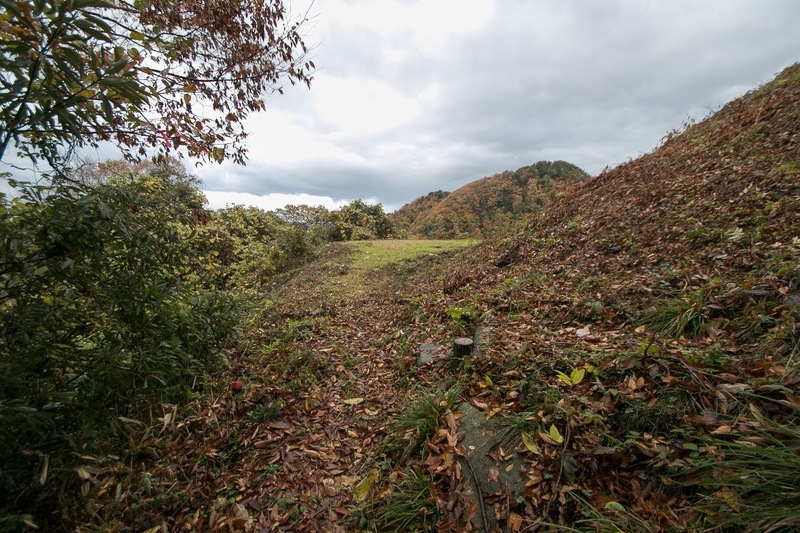 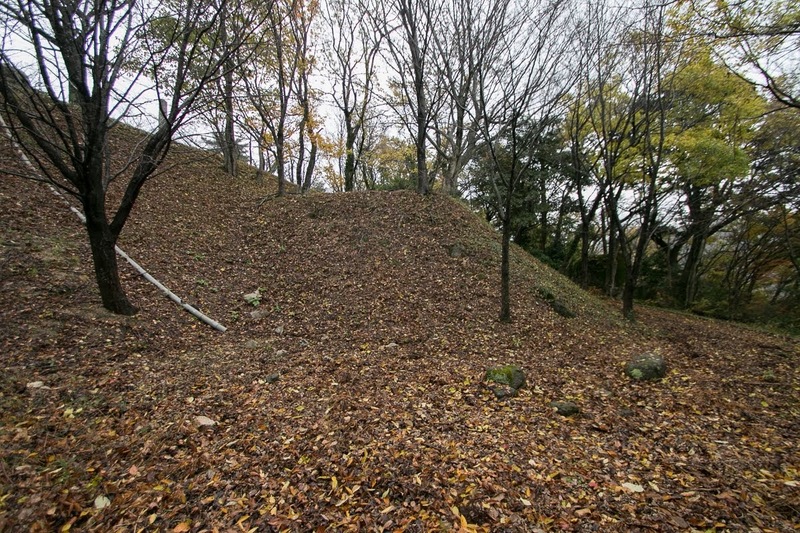 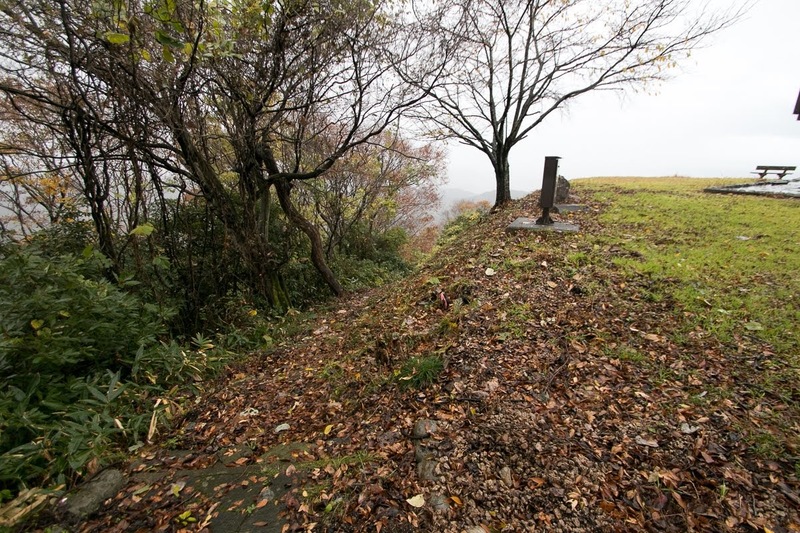 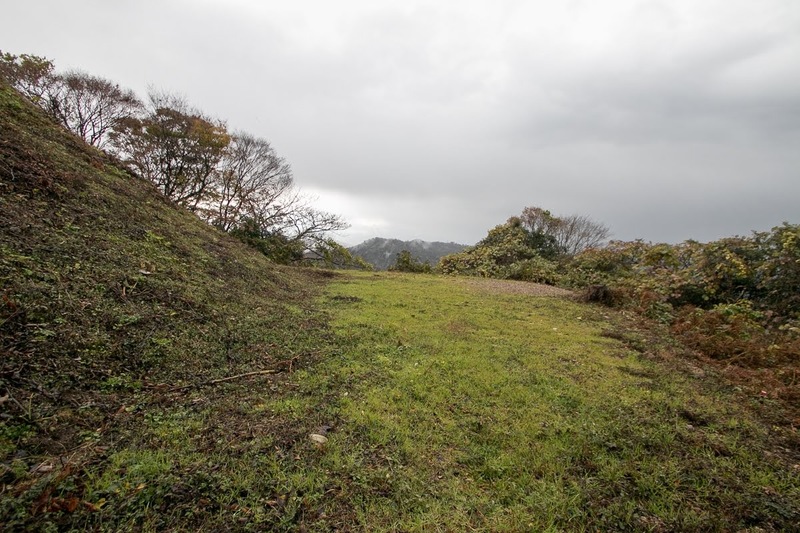 Nanjo clan seek the chance of recovery of Ueshi castle over 20 years, and by 1560, Motonari Mouri (1497-1571) which was originally small lord of Aki province (Hiroshima prefecture) grew to the large power of Chugoku region and entered total war with Amago clan. 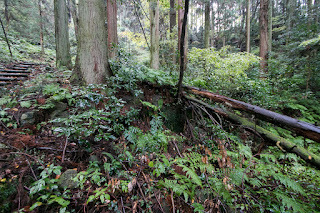 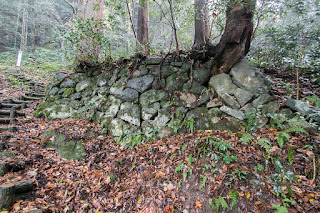 To suppress Amago clan from backside, Mouri clan supported former local lords of Houki province to resist against Amago clan, and Nanjo clan finally recovered Ueshi castle from Amago clan under the support of Mouri clan in 1562. Nanjo clan became an important retainer of Mouri clan, and strengthened Ueshi castle. 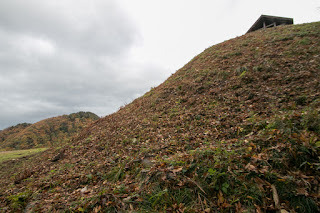 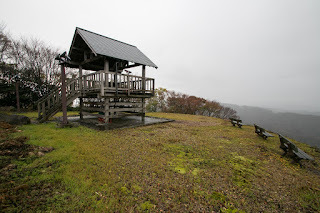 Ueshi castle was built at a steep mountain soaring into the sky. 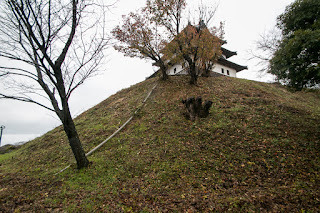 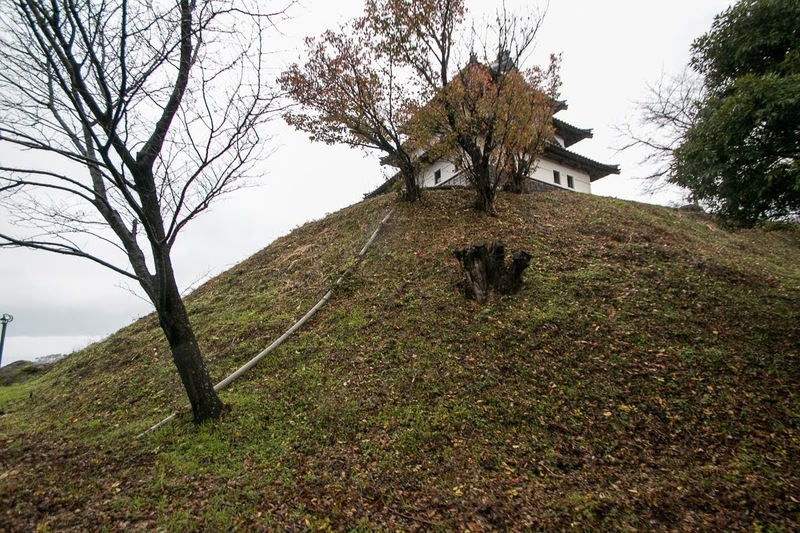 Looking up from hillside, an imitation of main tower over steep cliff looks formidable. 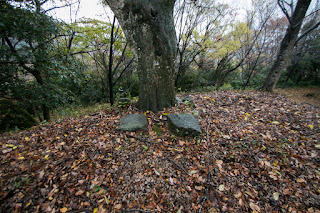 The name of Ueshi means a rock one which celestial robe is hung, and stem from a lagend of heavenly maiden. This legend is a kind of heavenly maiden which spreads all over the world, and in Japan heavenly maiden appears instead of swan. 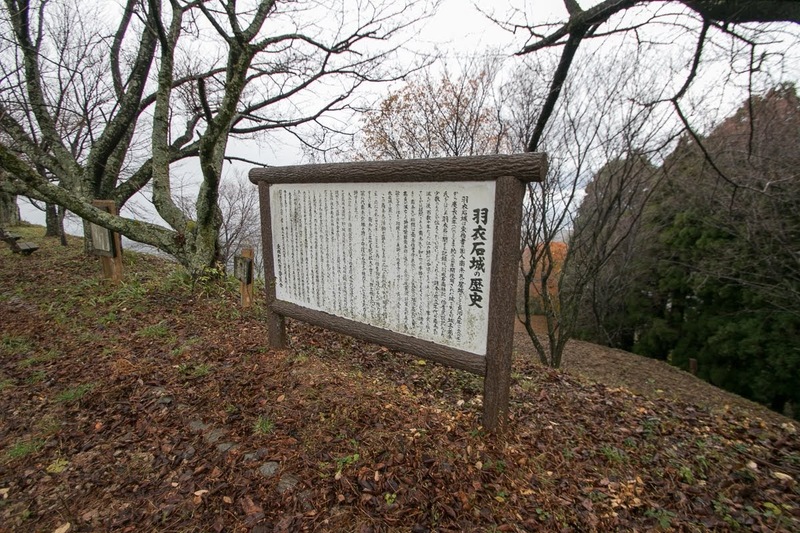 According to this legend, once upon a time, a heavenly maiden lived at this mountain , and took a bath at pond hanging its celestial robe at a rock. 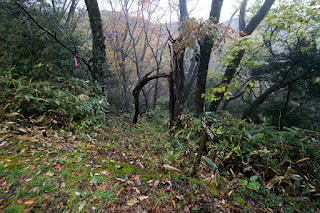 One day a pheasant passed at this mountain found this robe and hided it, thus this heavenly maiden who could not go back to the heaven because of the lost of celestial robe, reluctantly married with this pheasant. Later two son were born and this pheasant lived happily with them, but one day the maiden asked their son about the place of hided celestial robe and found it, then returned to the heaven. 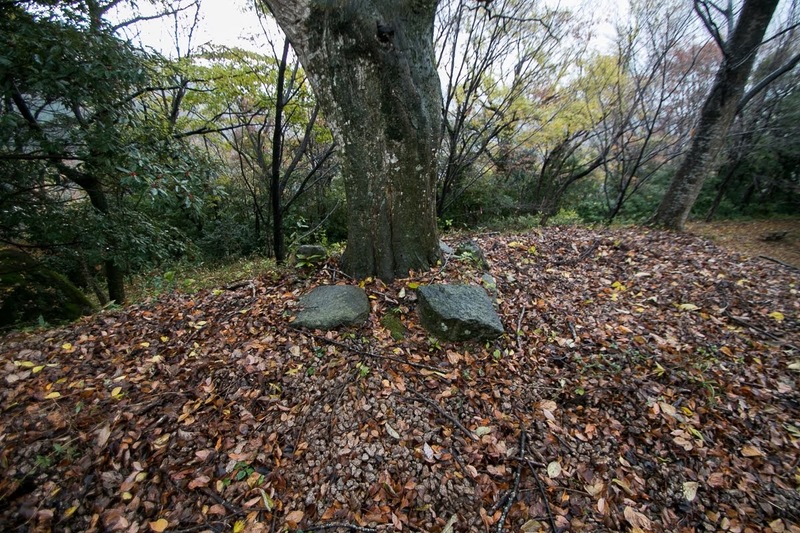 Grieved sons played drum and flute to recall their mother, but her mother never returned again. 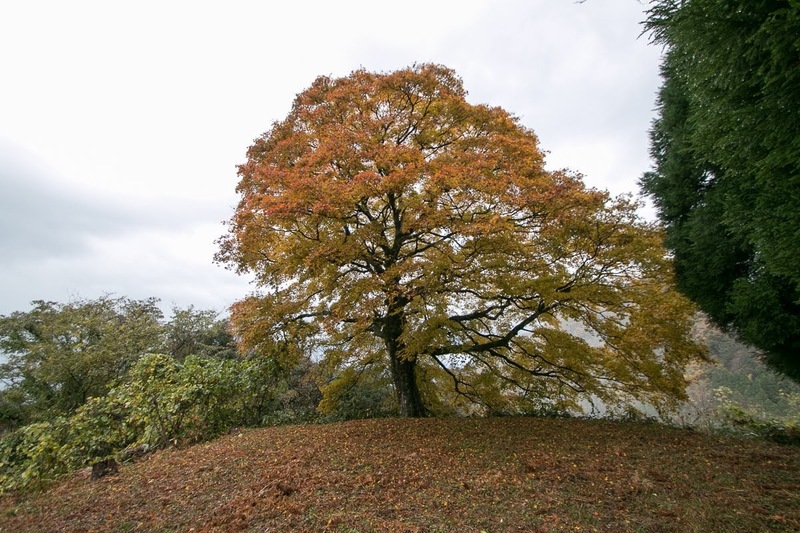 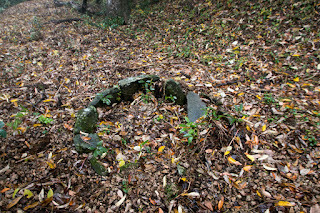 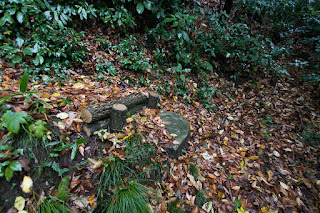 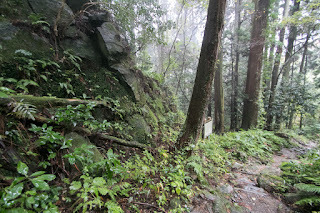 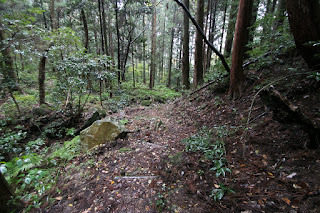 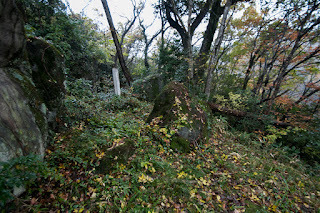 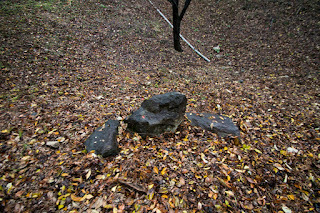 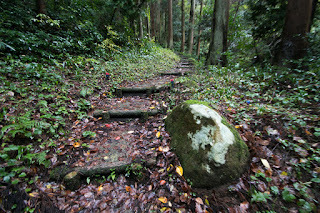 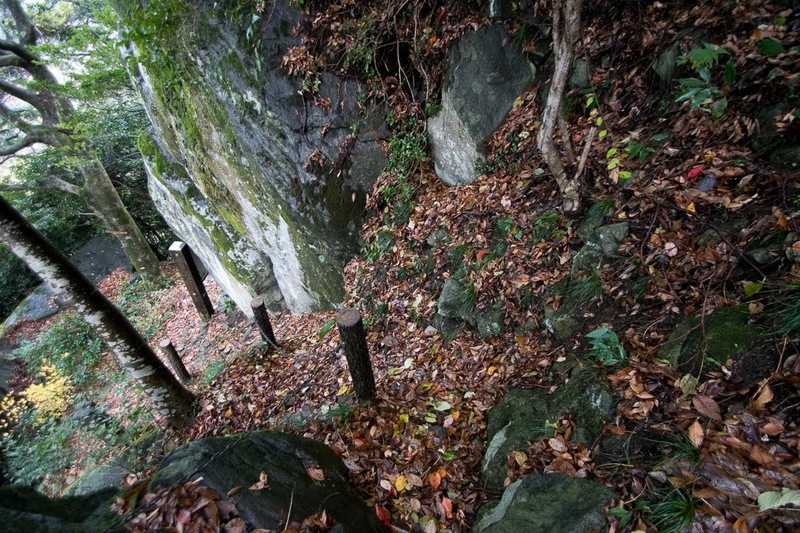 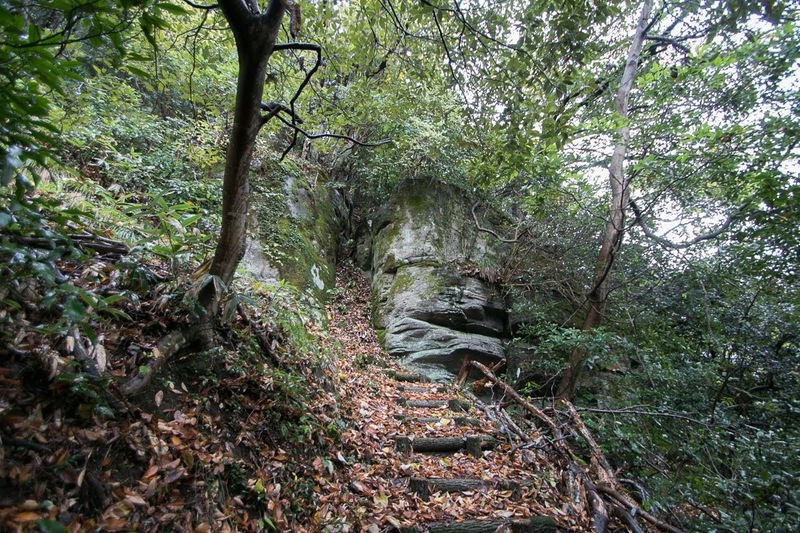 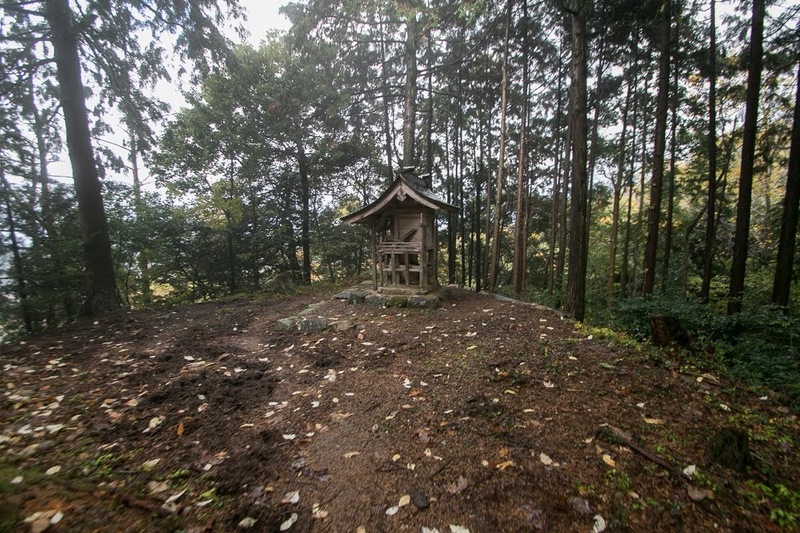 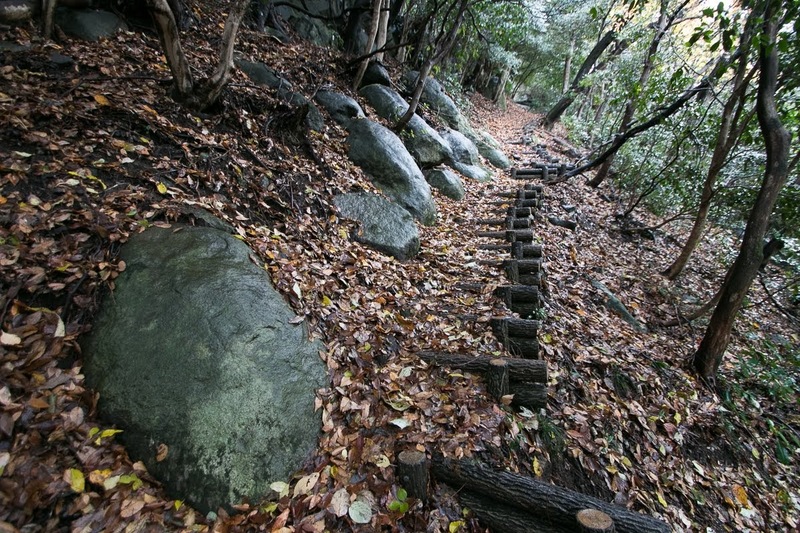 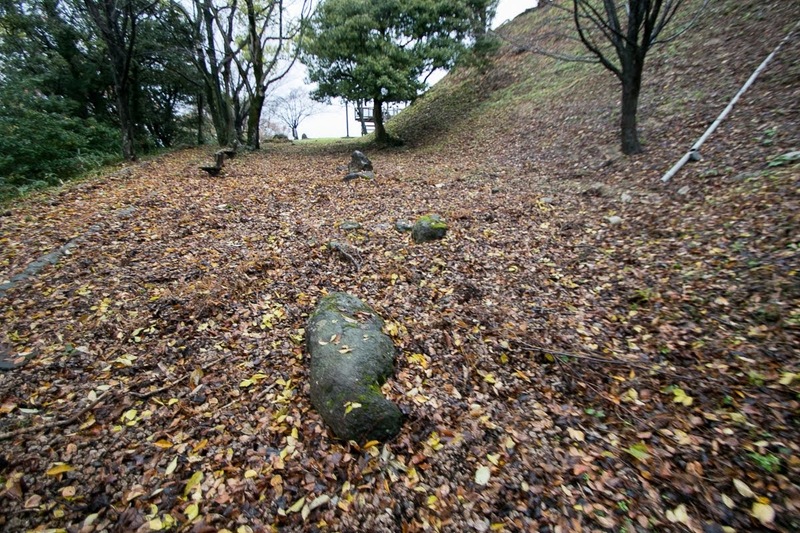 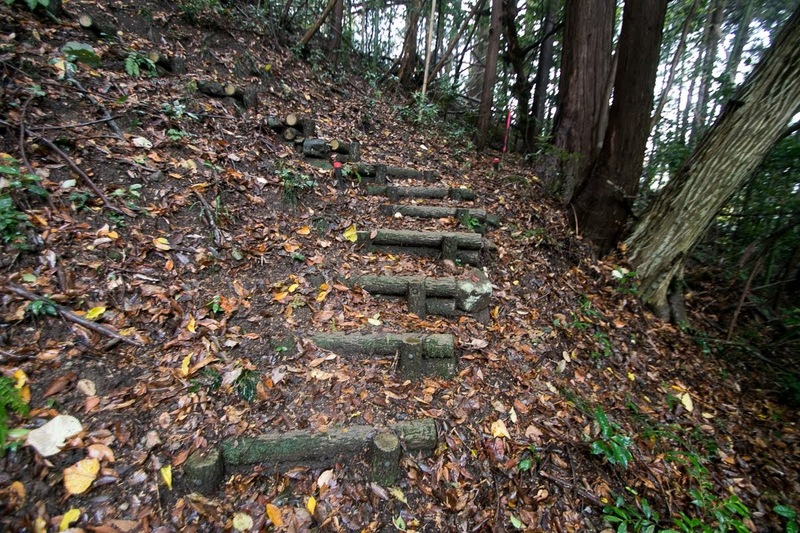 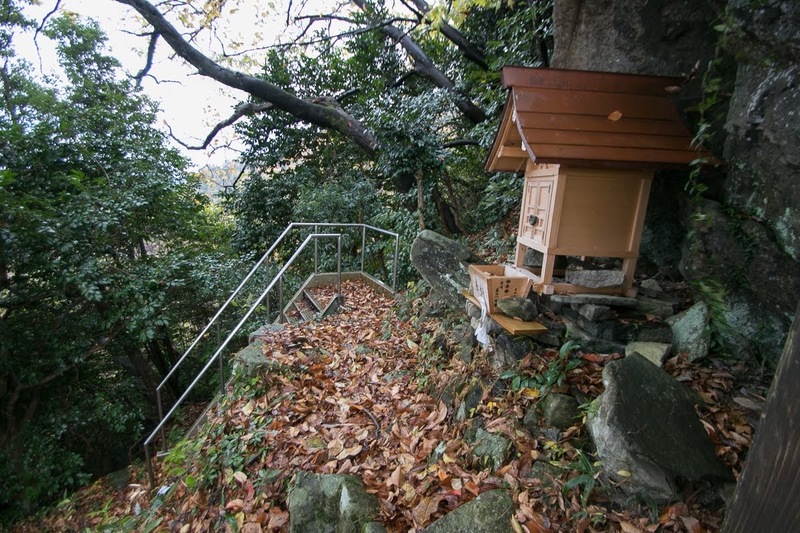 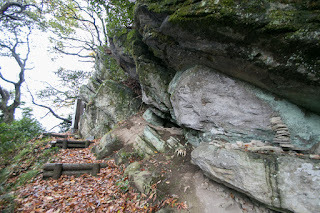 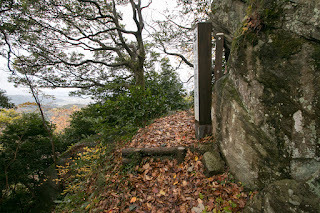 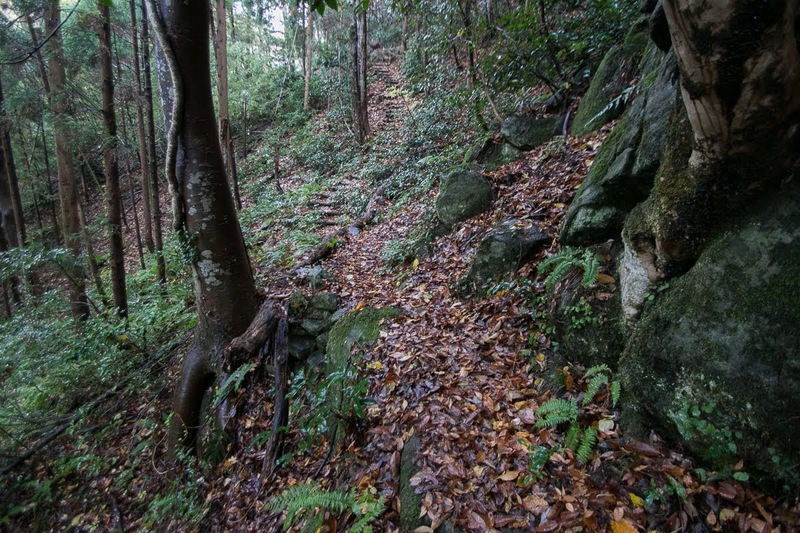 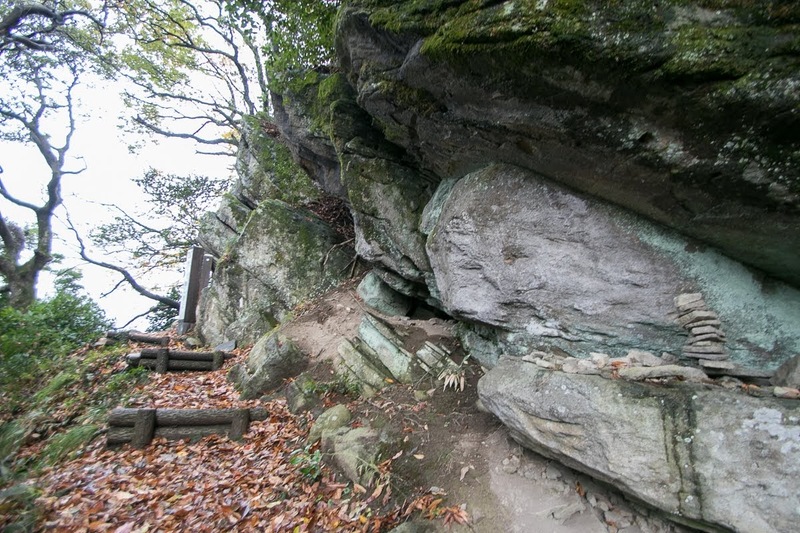 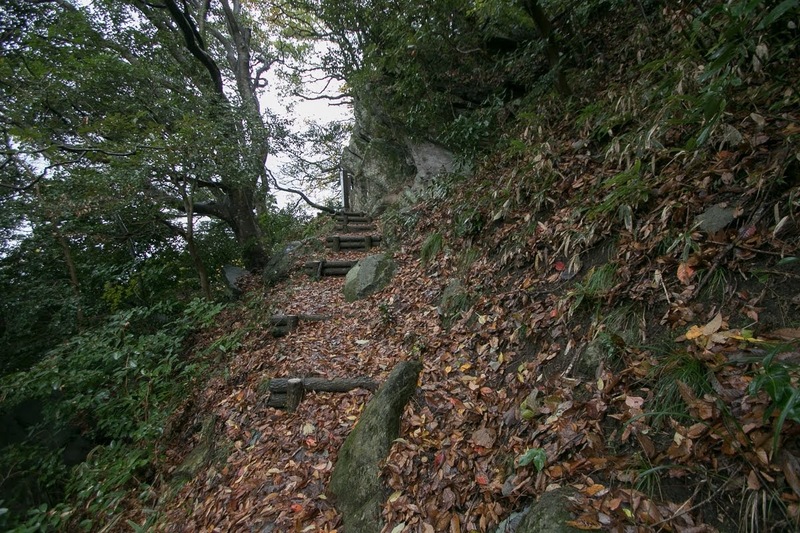 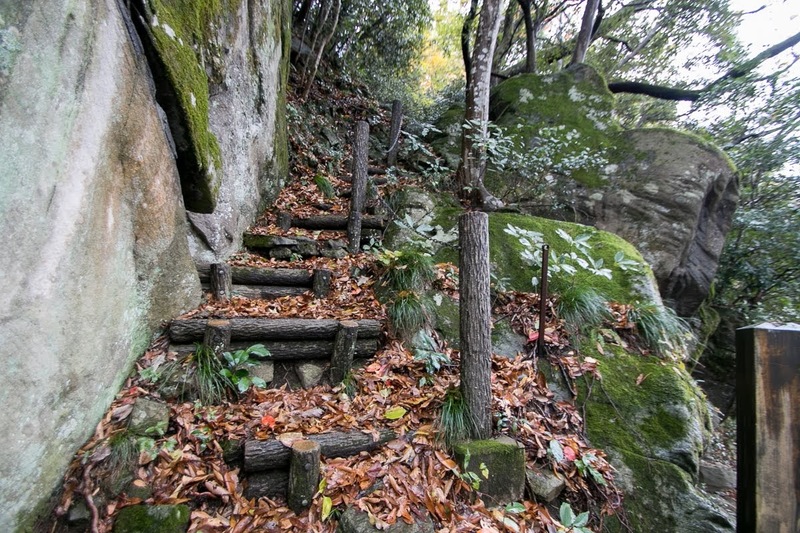 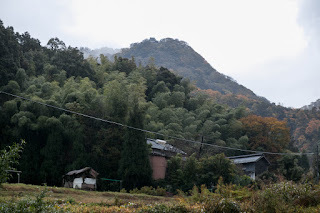 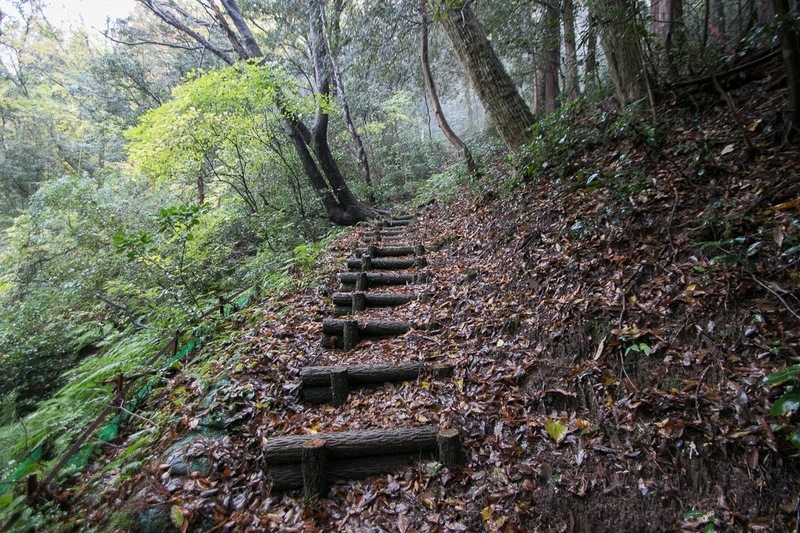 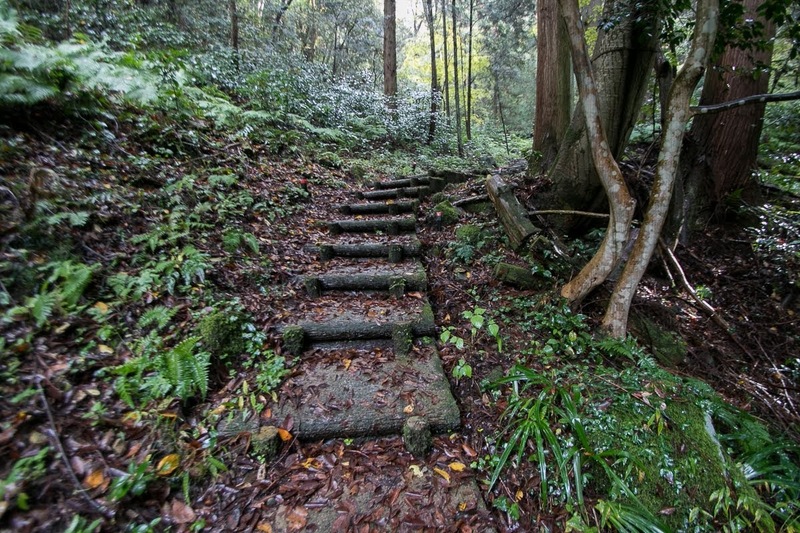 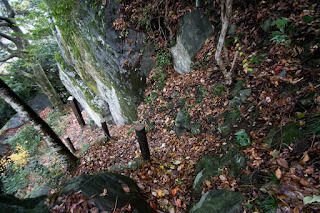 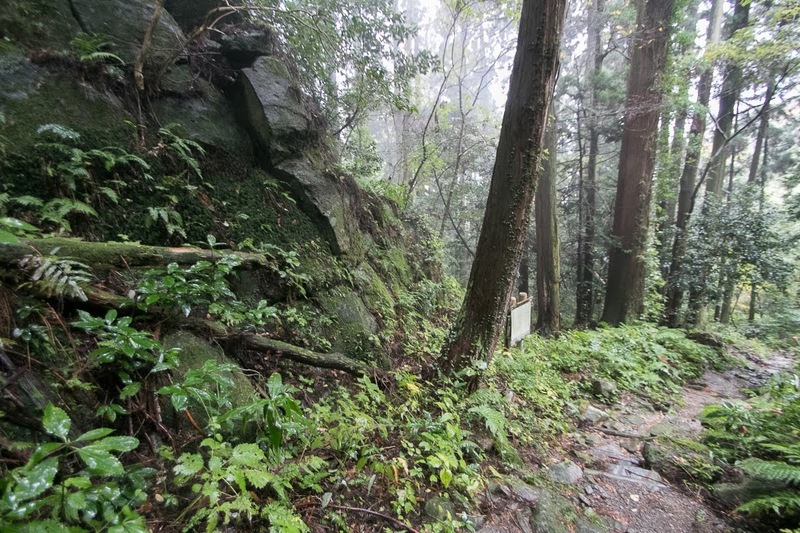 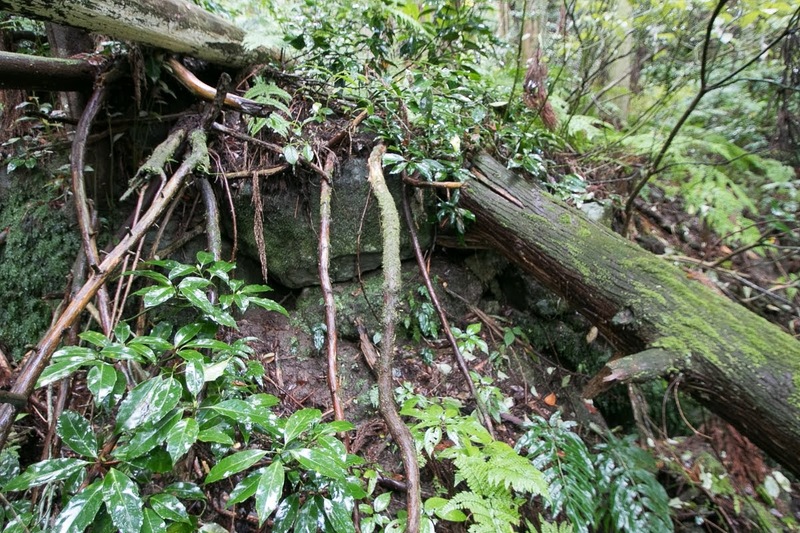 The huge rock at Ueshi mountain is used for hanging the robe, and the place where the sons played drum and flute became called as Utsubukiyama mountain, where Utsubukiyama castle located. 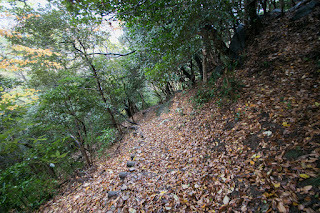 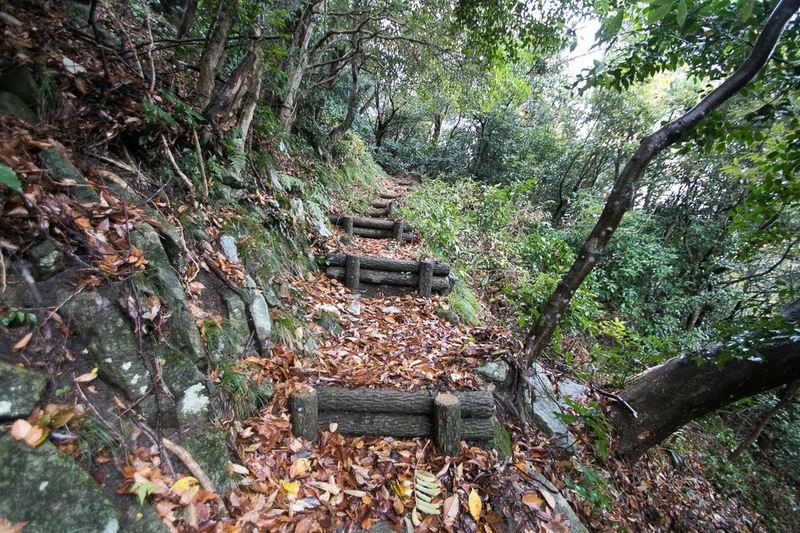 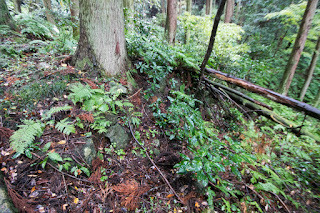 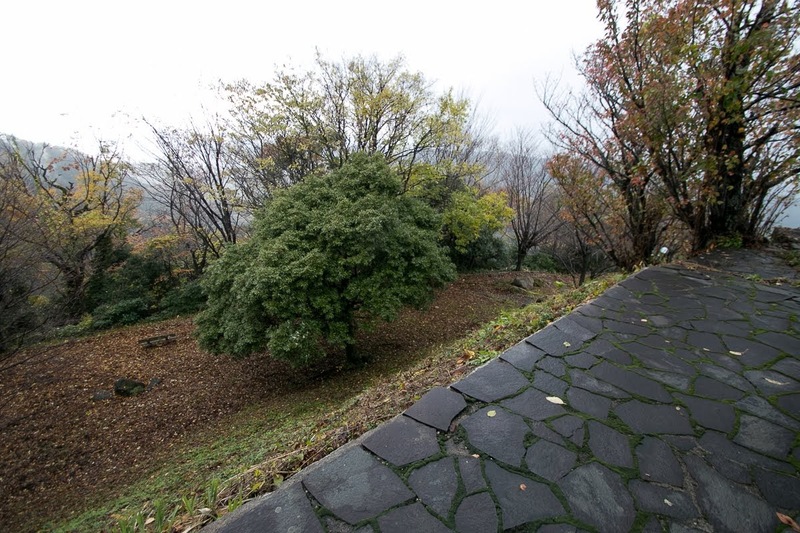 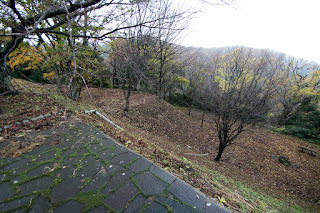 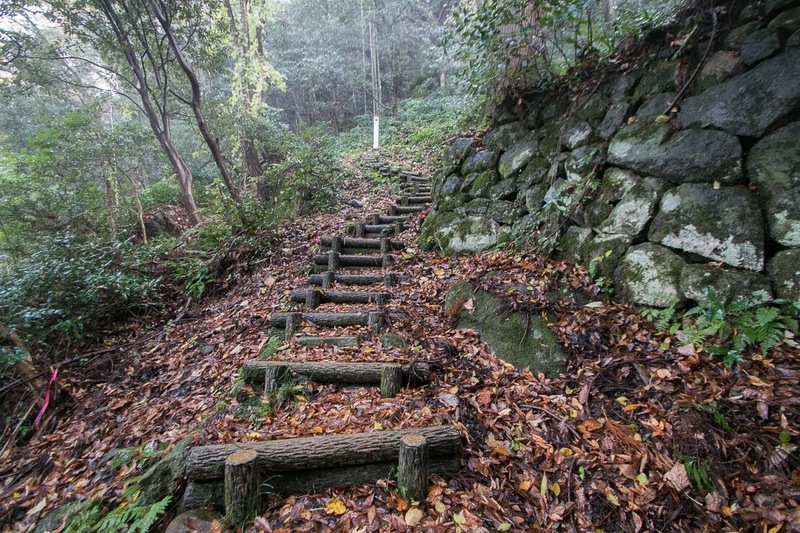 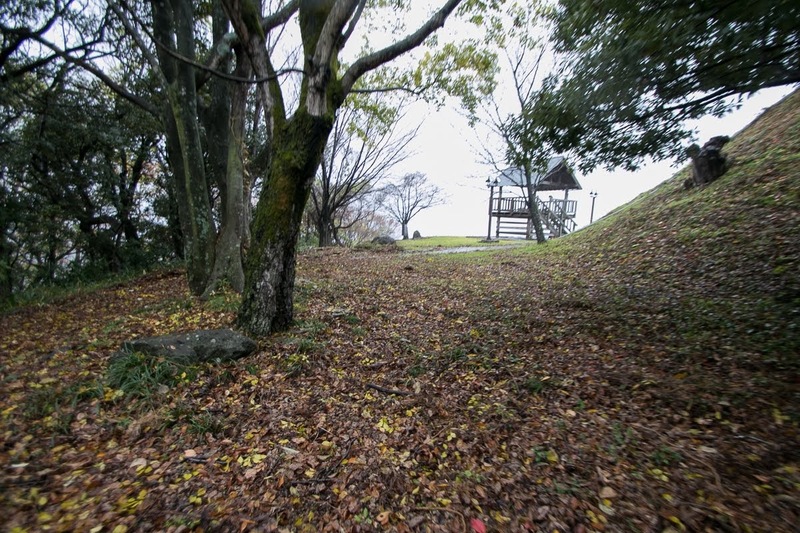 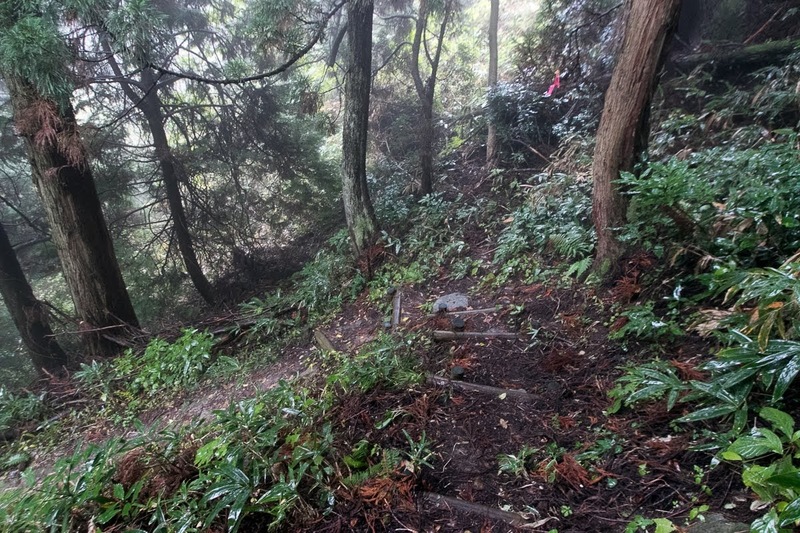 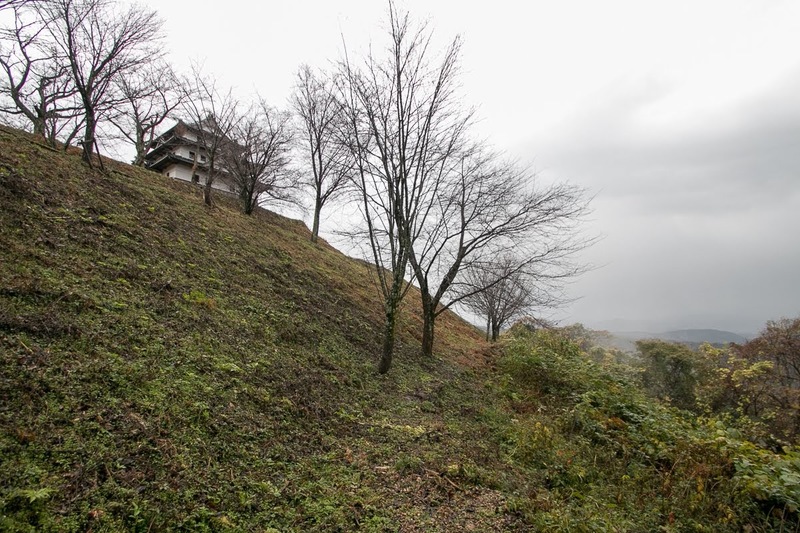 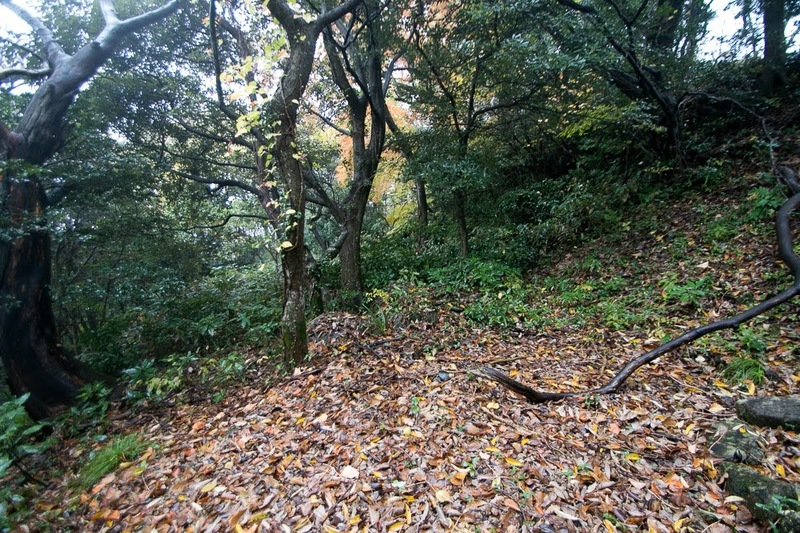 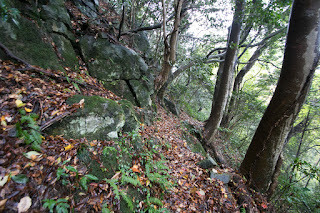 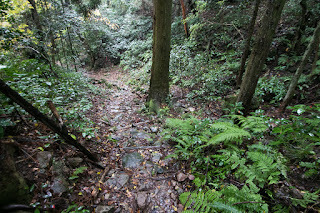 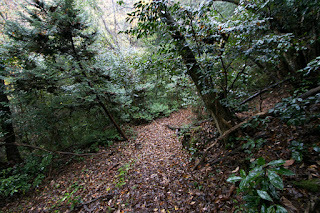 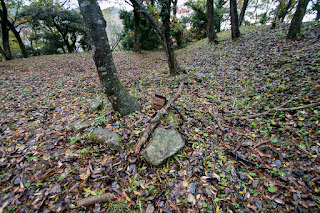 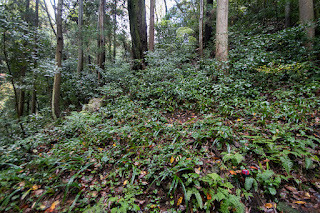 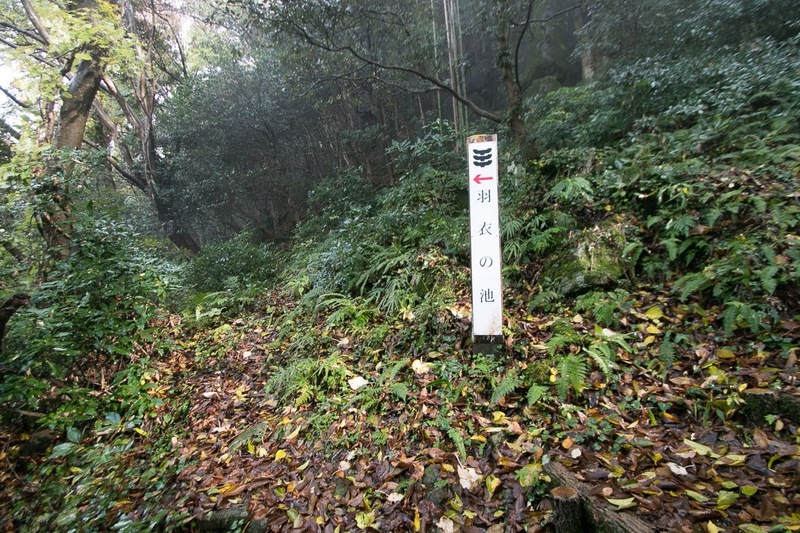 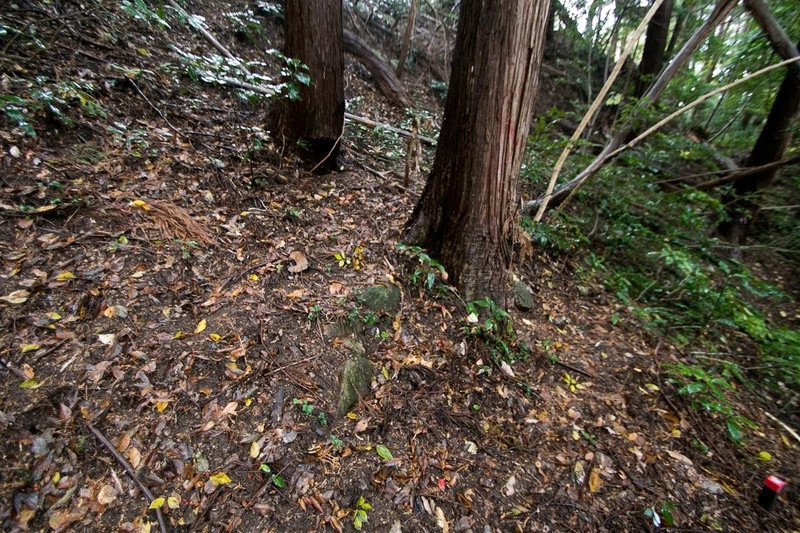 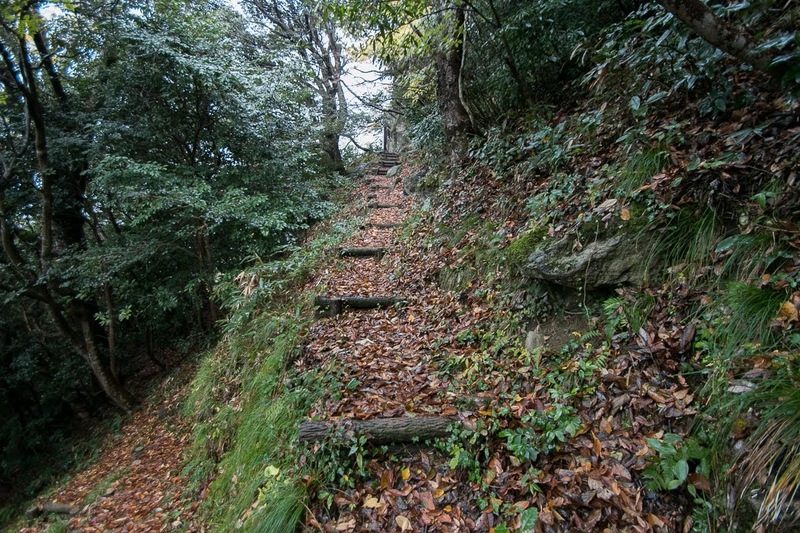 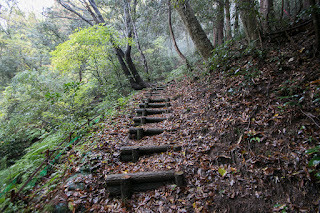 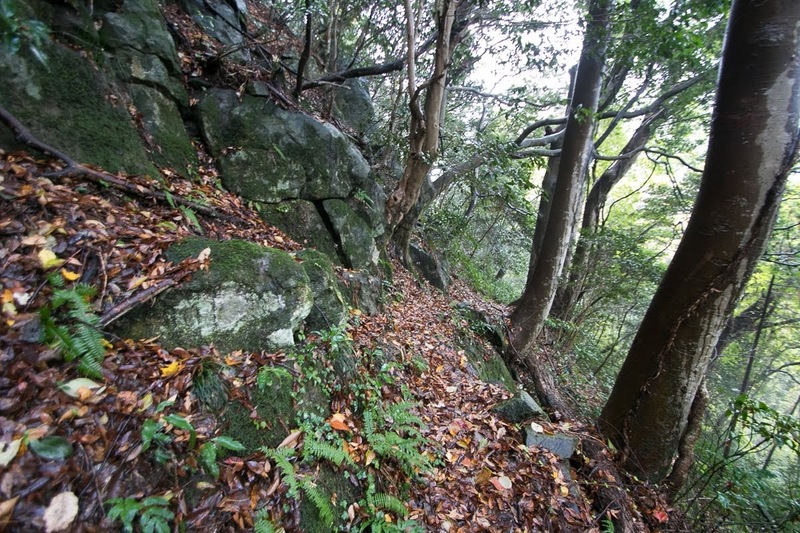 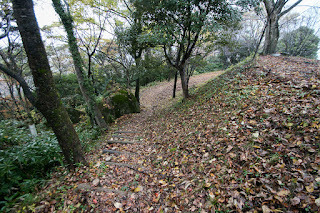 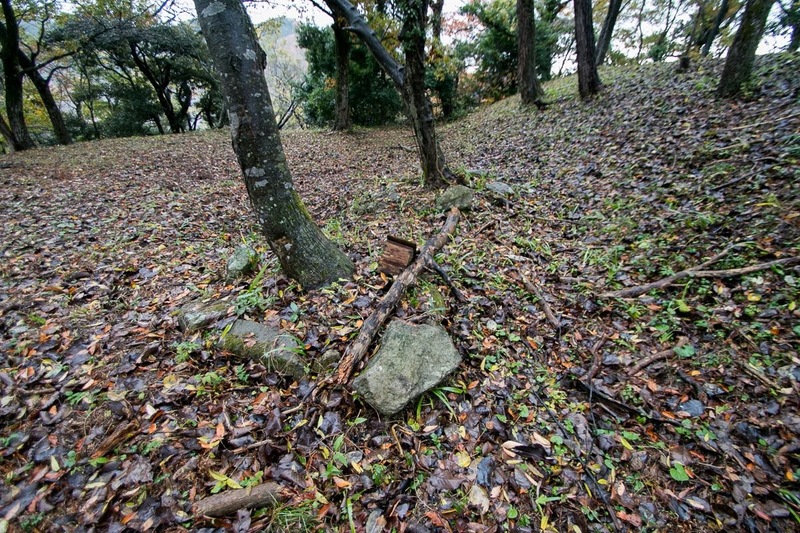 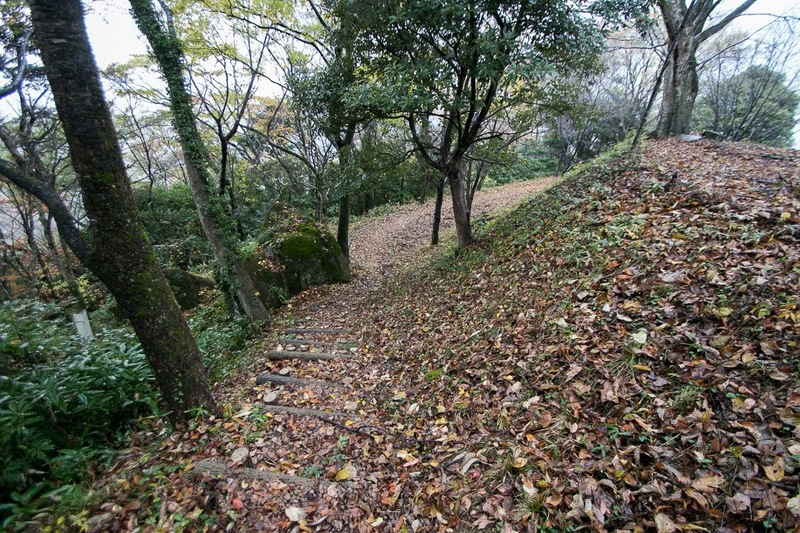 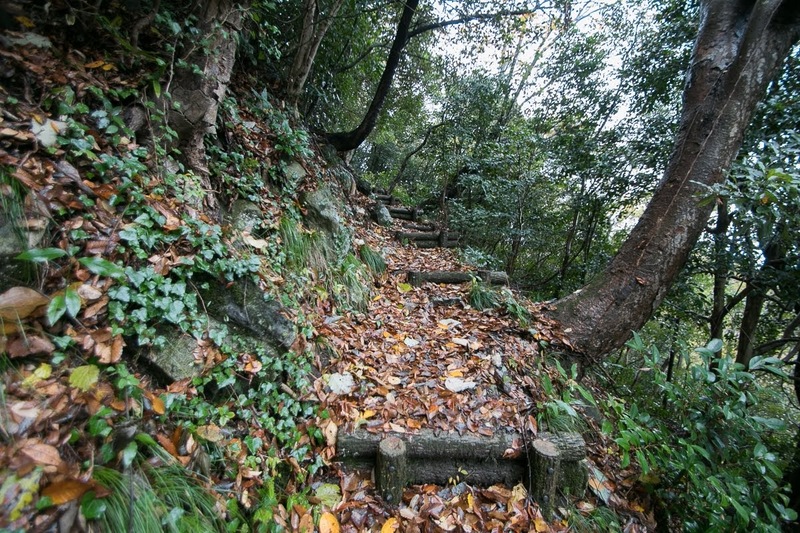 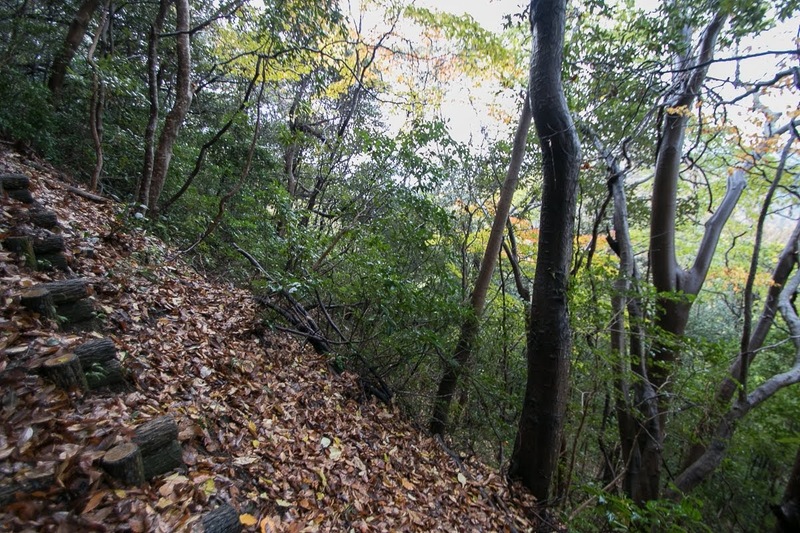 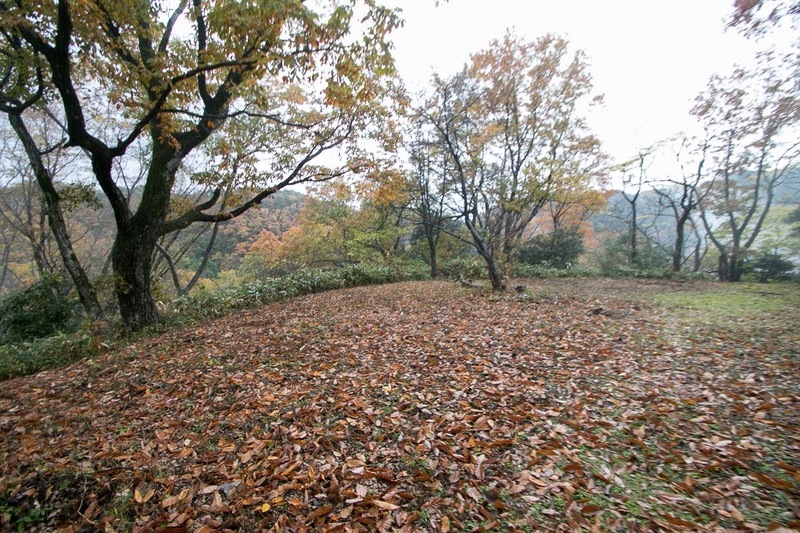 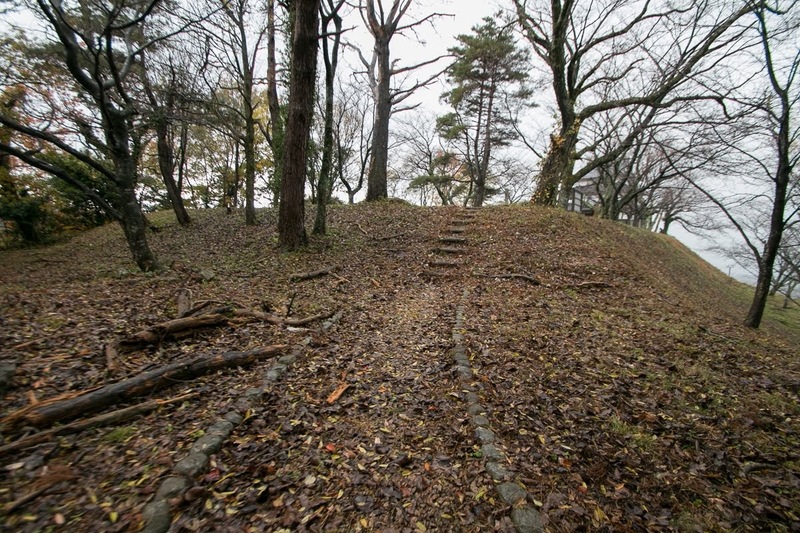 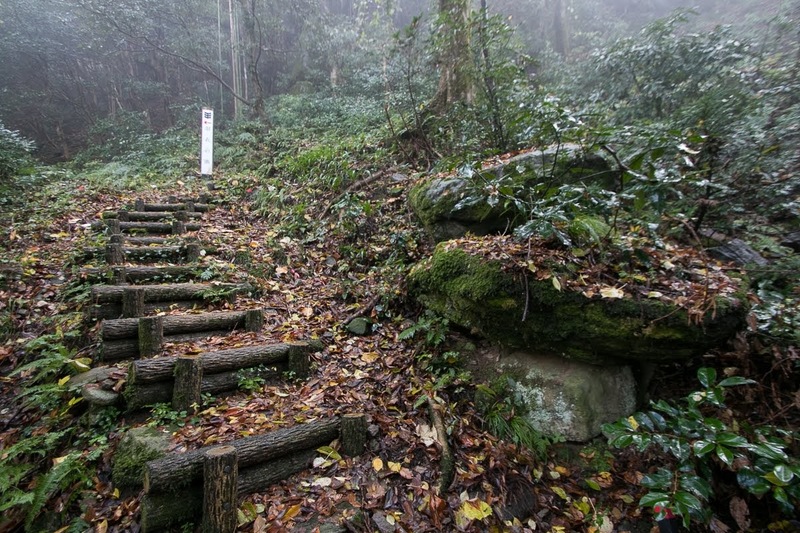 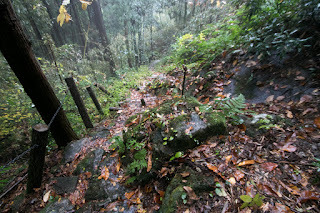 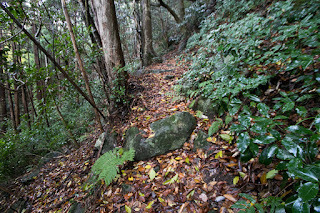 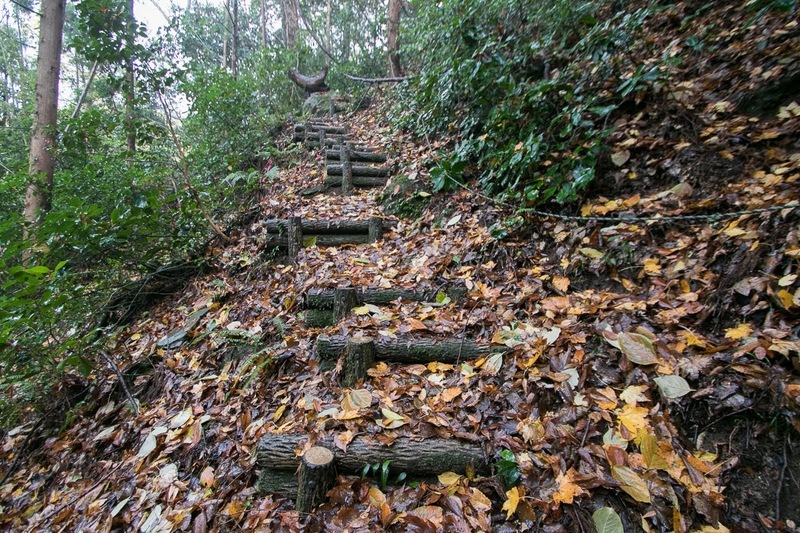 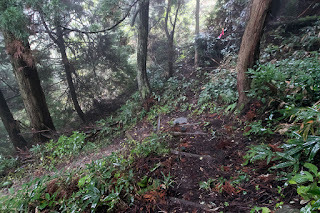 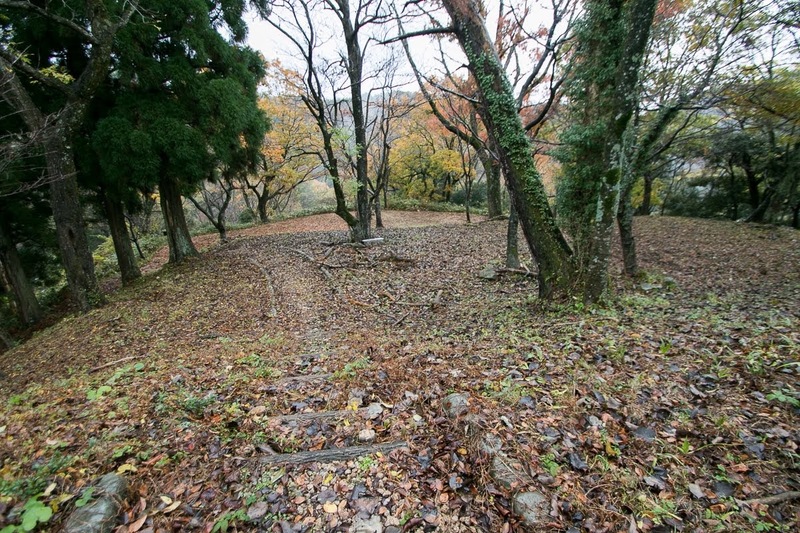 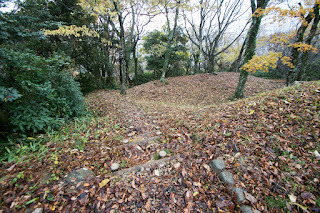 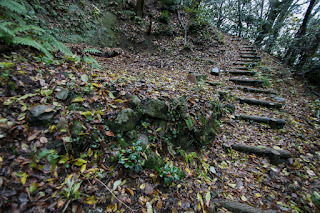 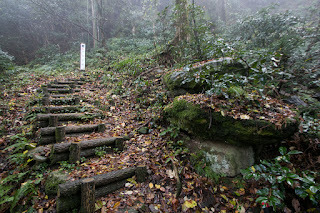 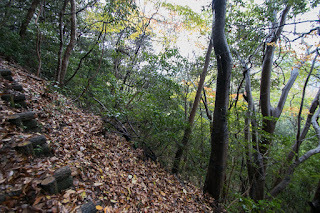 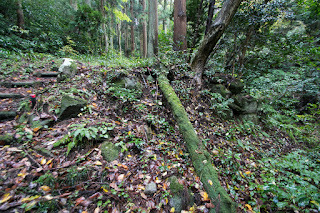 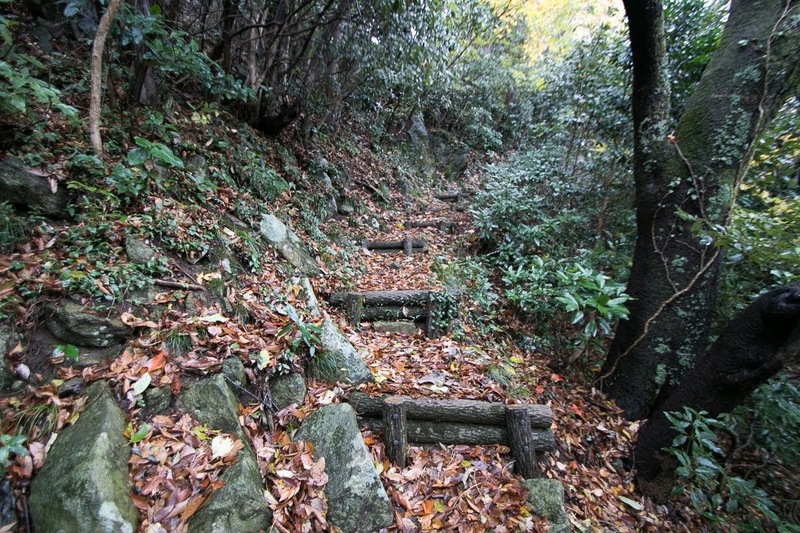 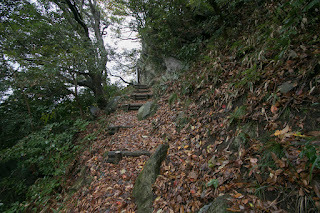 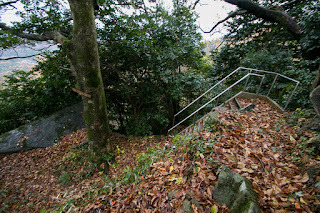 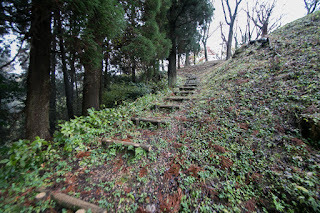 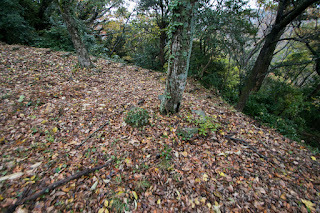 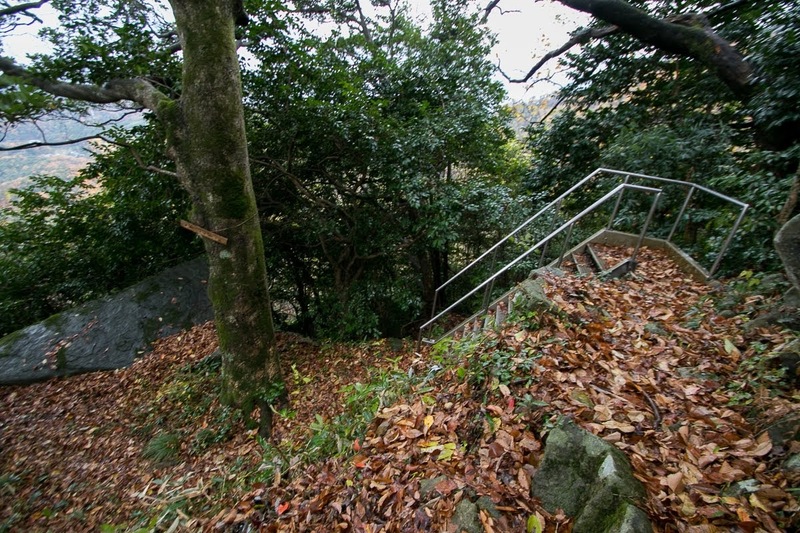 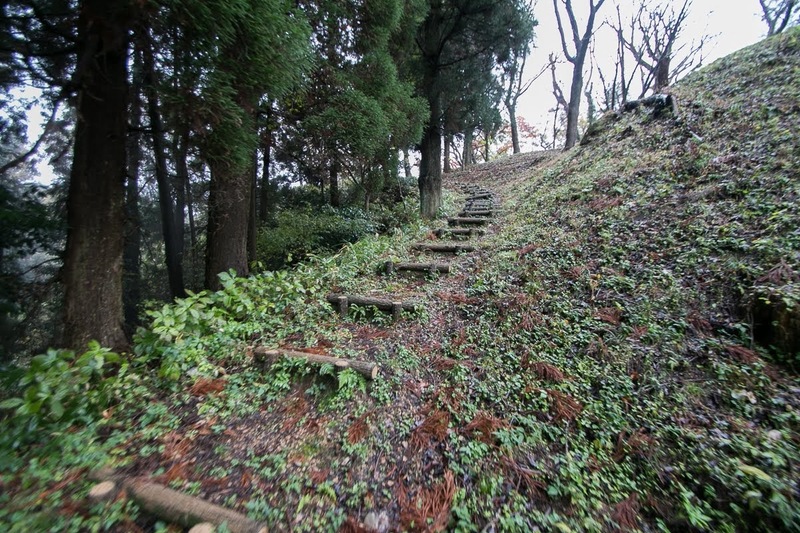 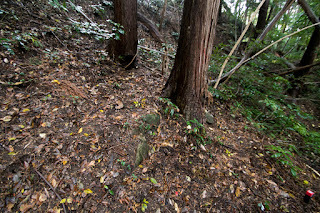 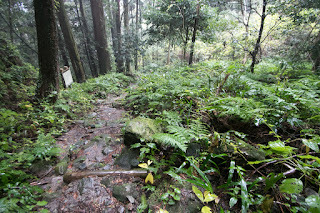 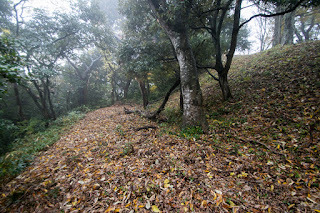 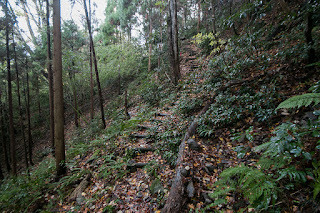 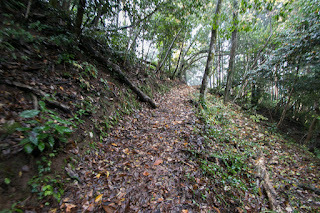 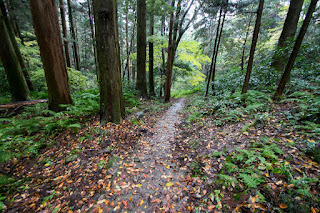 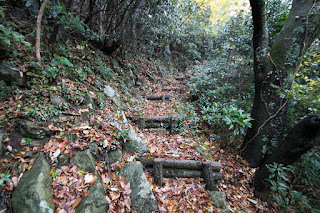 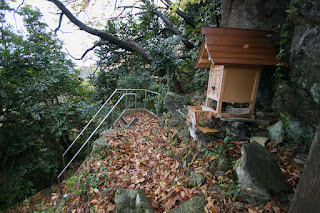 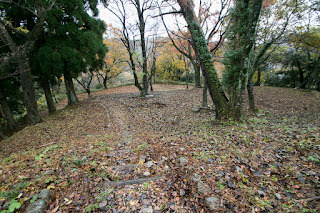 Ueshi castle itself spreads at a narrow flat place of the peak of Ueshi mountain. 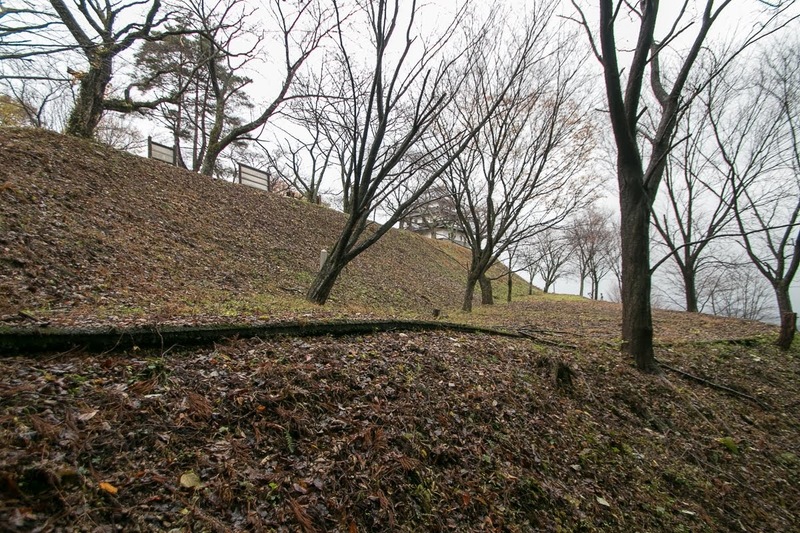 The central area is a narrow rectangular area of 100 meter long and 20 meter width, and has a folding gate at its south side. 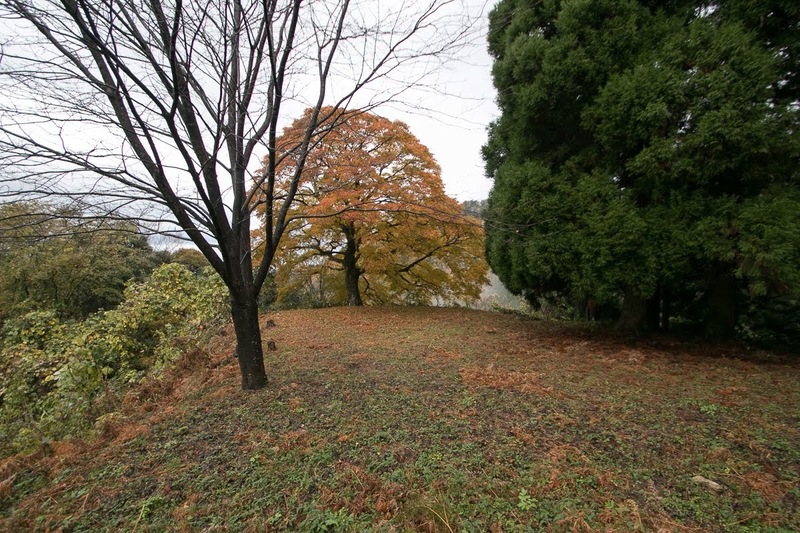 At backside of the central area there is the secondary area which is a small square shaped terrace, and corridor area surrounds these two areas. 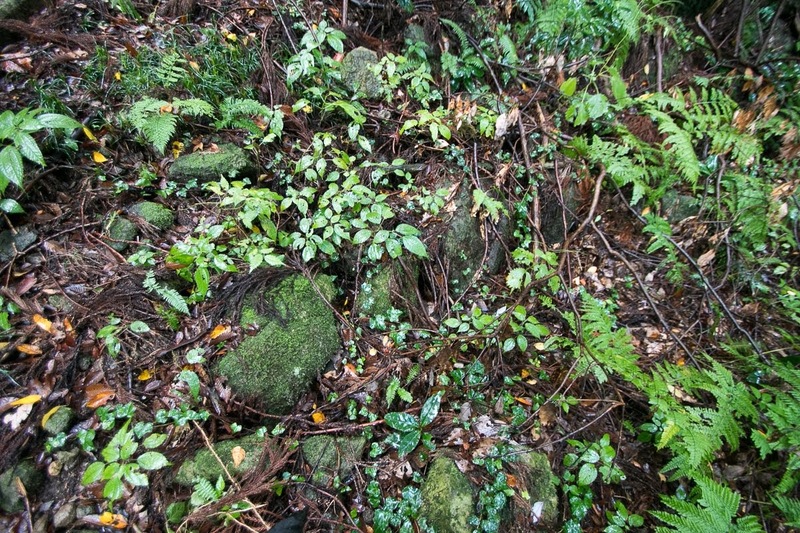 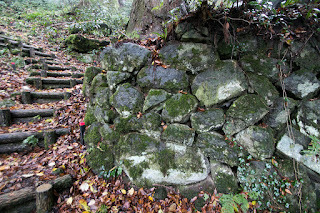 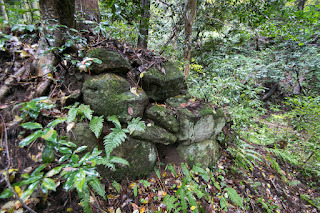 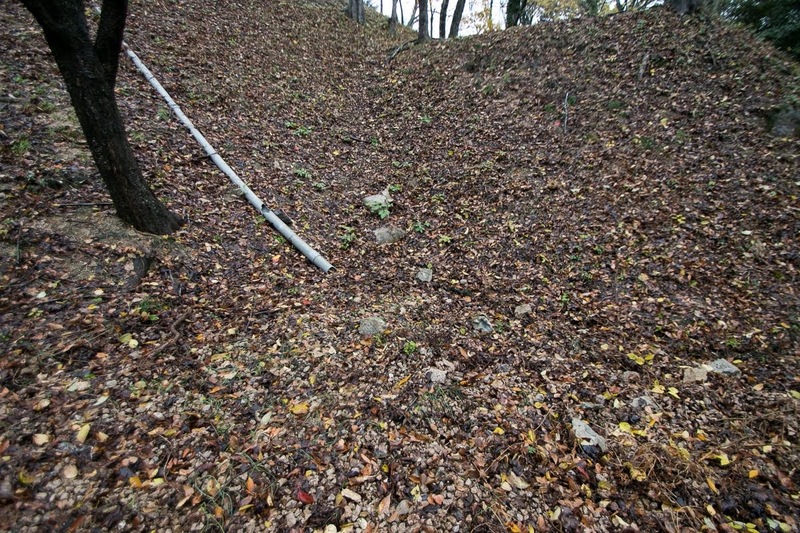 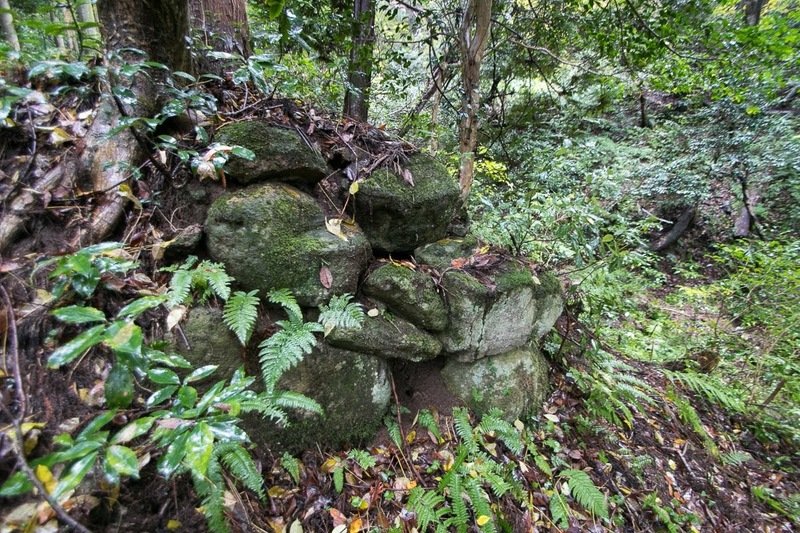 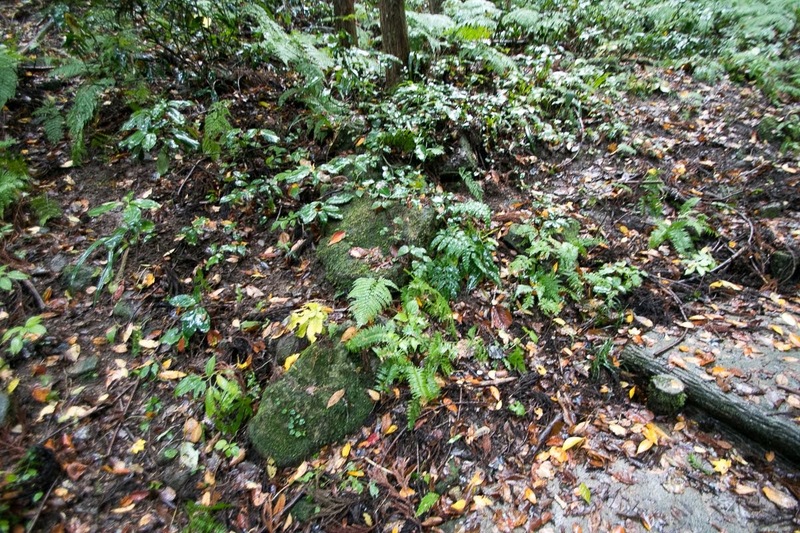 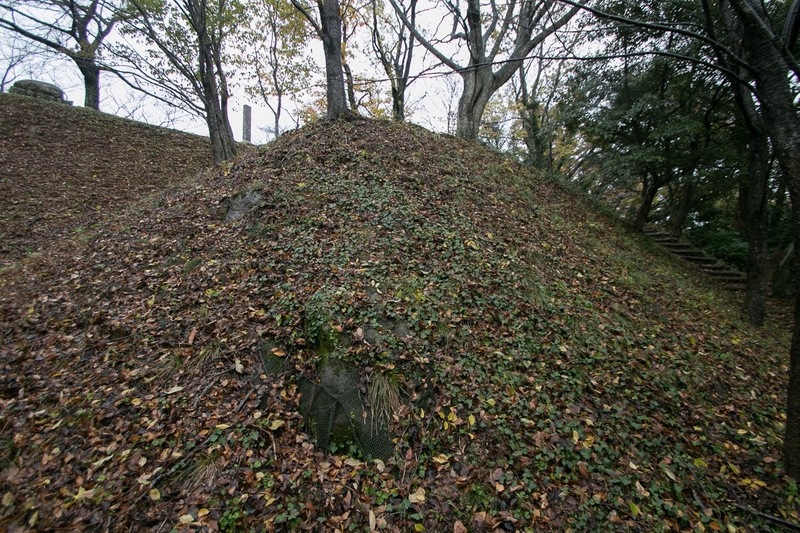 These core areas are thought to be protected by stone walls, and ruin of stone walls slightly remain at this area. Two large ridges spread toward northwest from hilltop area, and terraces are built along these ridges. 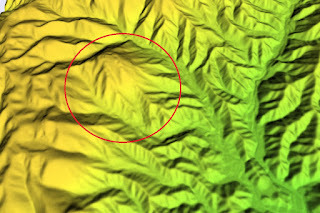 The valley passes between these two ridges is a main route toward hilltop area, and stone walls are built here and there at landing floors of climbing road. 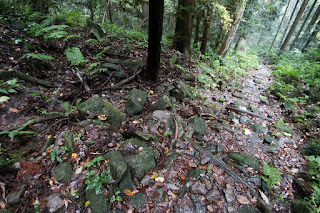 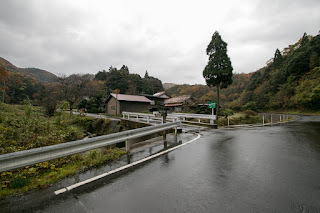 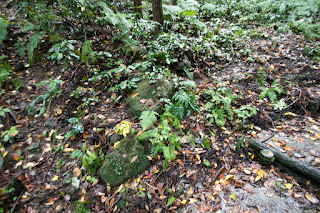 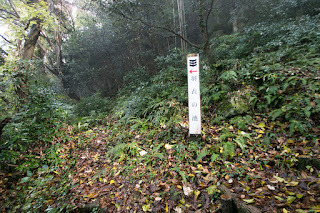 A huge rock mentioned at the legend of heavenly maiden is just below the central area on this road, and this is used as a natural main gate and also might gibe authority to the lord. 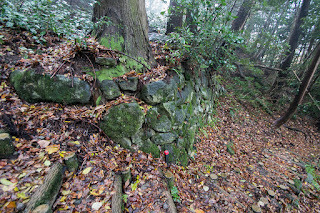 Another climbing road detours from north of the ridge is a backside route, and also guarded by stone walls and rocks. 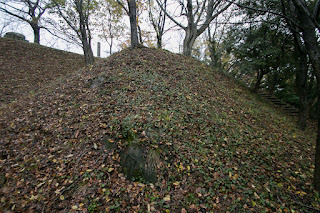 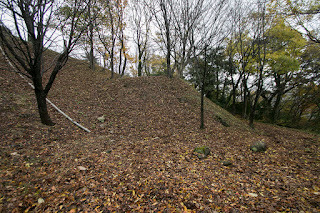 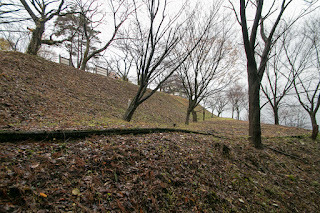 East side of the castle connects to backside mountain is securely shut by continuous dry moats, but this place is still a weak point of the castle and Ueshi castle continuously fell by the attack from this side. 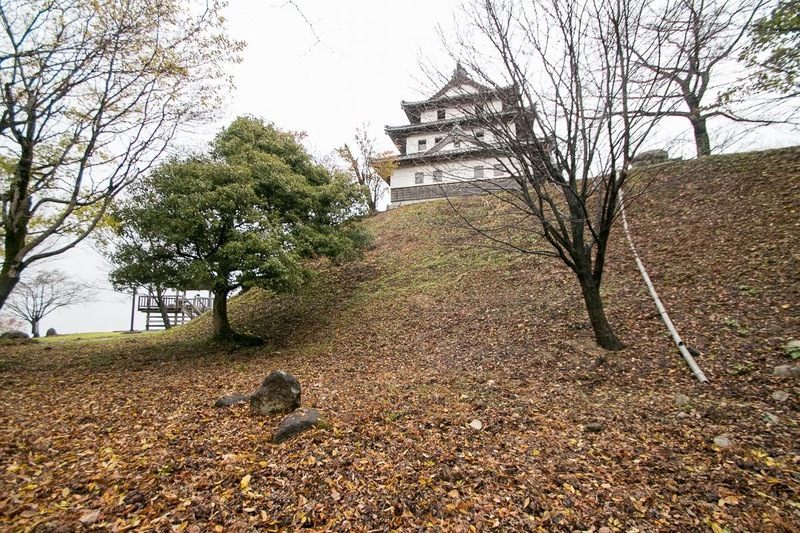 Even though being located at sheer mountain, because of limited size and no depth, actual security of this castle might not be so strong. 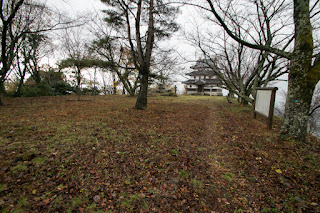 Nanjo clan belonged to Mouri clan nearly 15 years, but in the latter half of 1570's, the power of central ruler Nobunaga Oda (1534-1582) gradually reached to this area. In the summer of 1580 Hideyoshi Hashiba (1537-1598, later Hideyoshi Toyotomi), who was the regional commander of Nobunaga, attacked Tottori castle at Inaba province and once fell it. 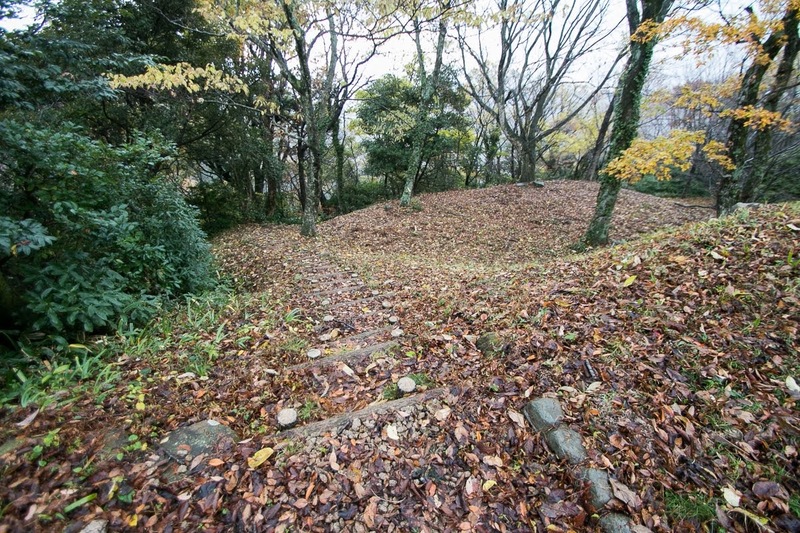 This time Mouri clan promptly recovered Tottori castle, but next year Hideyoshi came to Tottori area again and securely encircled the castle. 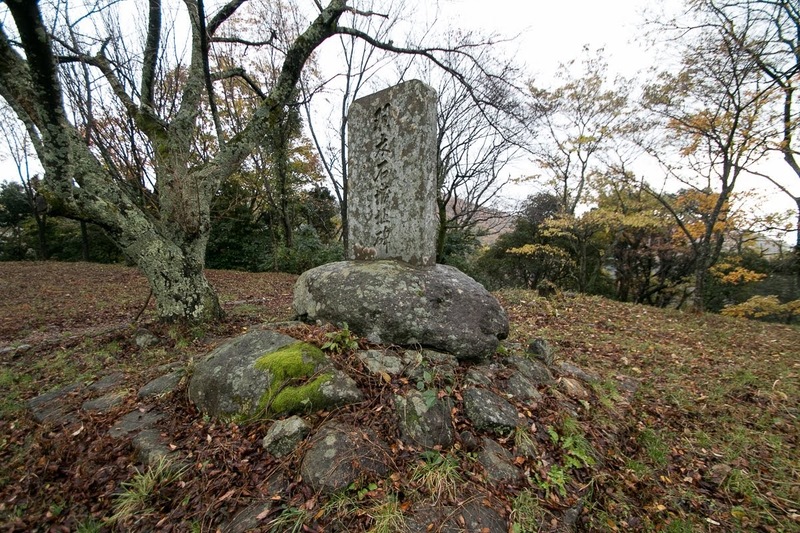 Seeing this situation, Mototsugu Nanjo (1549-1591), leader of Nanjo clan, decided to leave Mouri clan and support Hideyoshi. 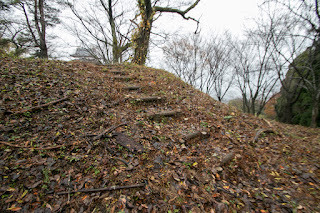 Ueshi castle was attacked by Motoharu Kikkawa (1530-1586), a brave general of Mouri clan who tried to rescued Tottori castle, but Ueshi castle stand this attack and finally Tottori castle fall without supply. 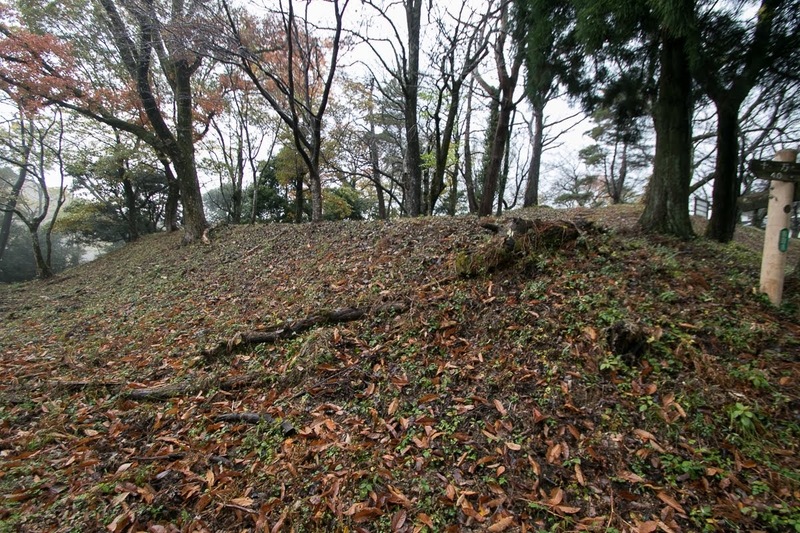 After that Mototsugu continued the fight against Mouri clan, but in 1582, because of the retreat of Hideyoshi after the incident of Honnoji, Ueshi castle fell by the attack of Mouri clan. 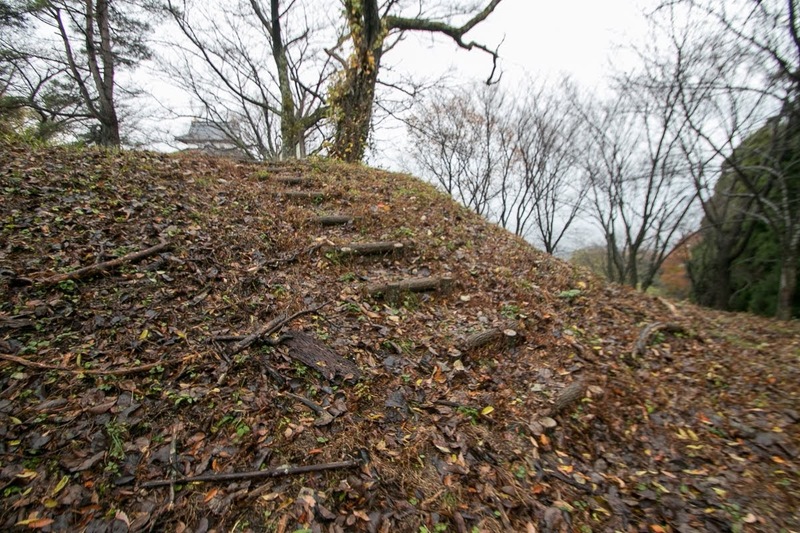 However, Mouri clan made peace with Hideyoshi who became the ruler, and Ueshi castle was returned to Nanjo clan. 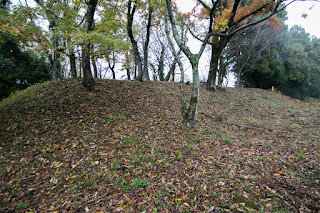 Nanjo clan which became the lord of east half of Houki province under Toyotomi government became to use Utsubuki castle at Kurayoshi city which is more closer to the town and sufficient size to manage its territory, but Ueshi castle was still kept as a original place of Nanjo clan. 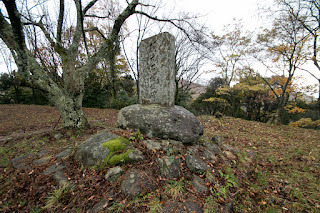 But after the death of Hideyoshi, Mototada Nanjo (1579-1615), son of Mototsugu, supported Mitsunari Ishida (1560-1600) who lost at the battle of Sekigahara, and lost its territory. 15 years after at the battle of Osaka castle Mototada supported Hideyori Toyotomi (1593-1615) and entered Osaka castle,. but his plan of betrayal was found and was forced to die. 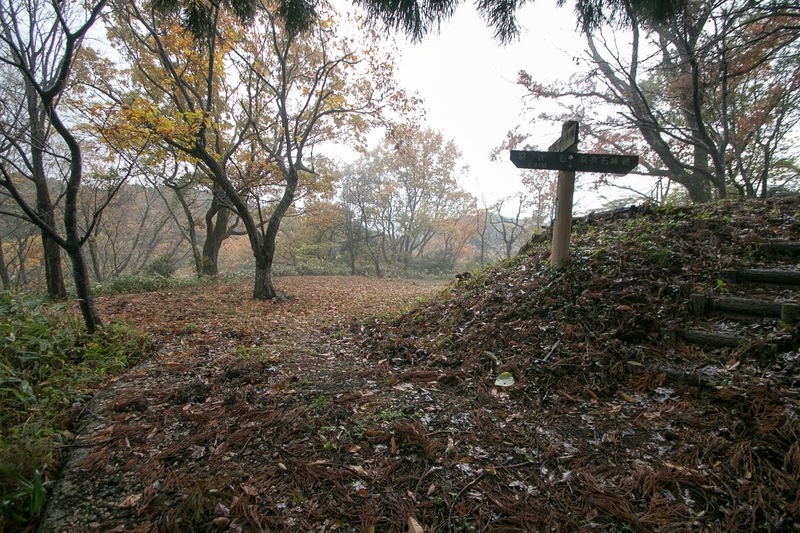 This sudden fall of Nanjo clan is as if the fate of the pheasant who was left by his heavenly maiden. 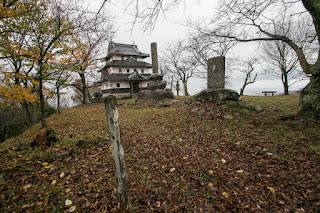 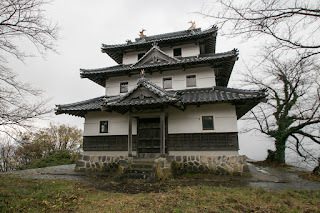 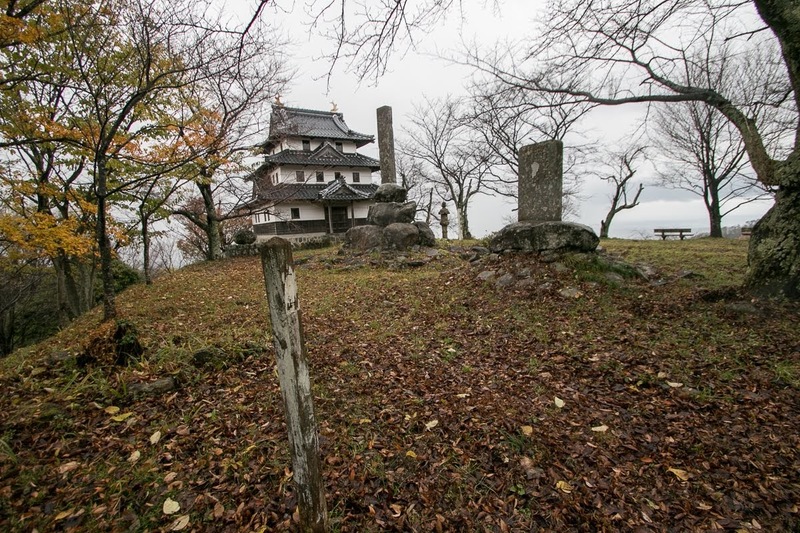 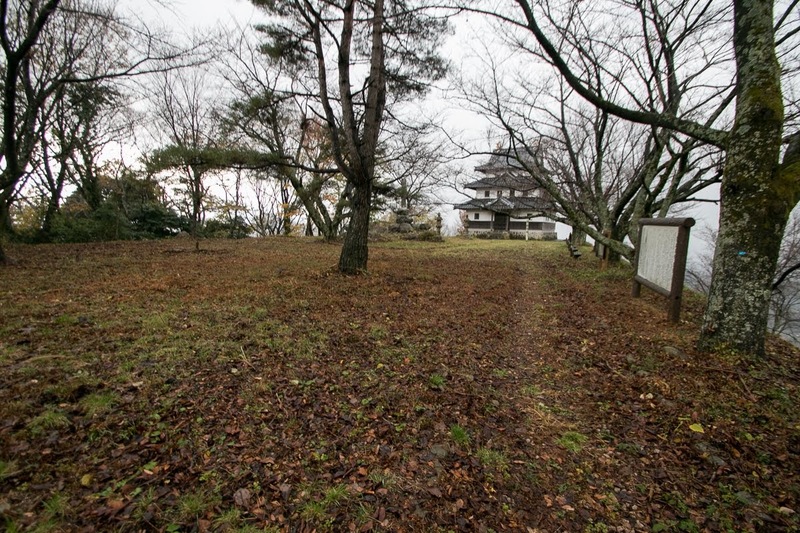 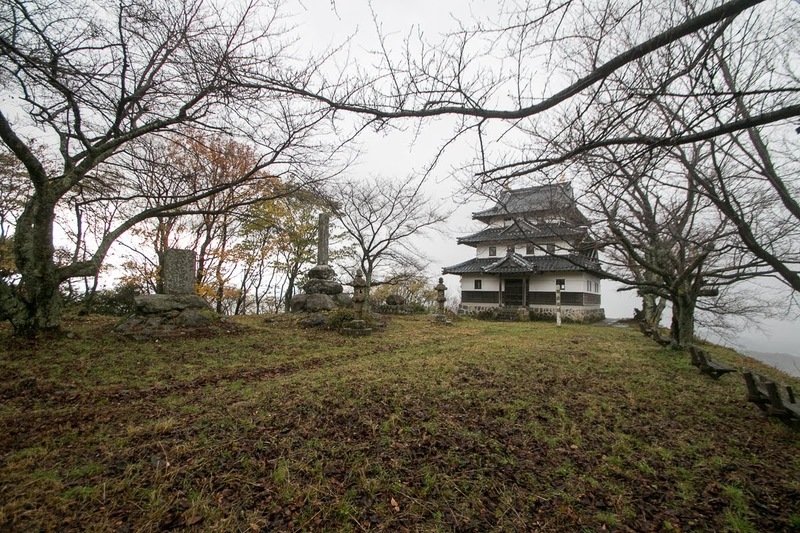 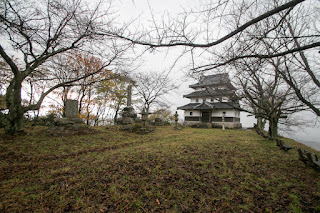 Ueshi castle was totally broken at the expel of Nanjo clan, and currently a main tower like building was built by a descendant of Nanjo clan but closed. 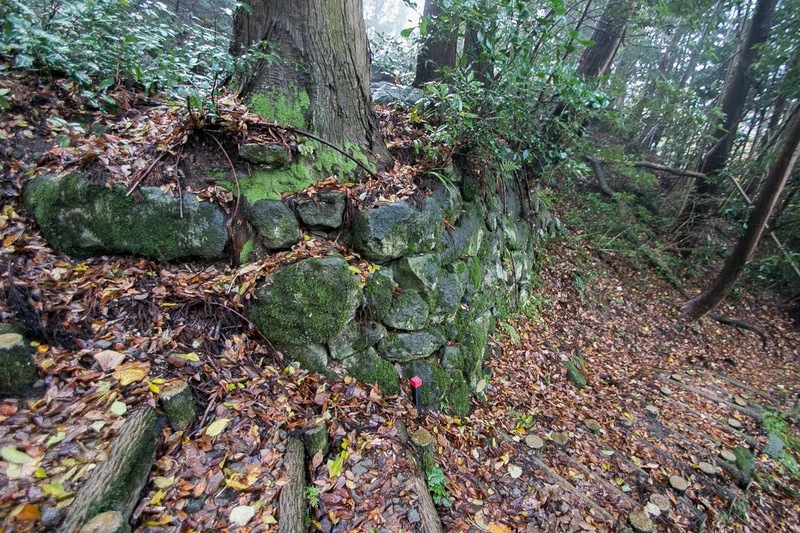 Stone walls partially remain along the climbing road, and especially a large wall still exists at the middle of front climbing route. 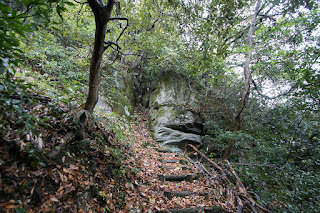 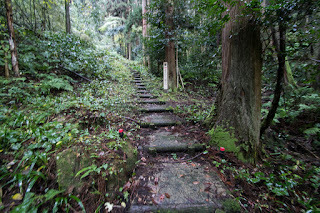 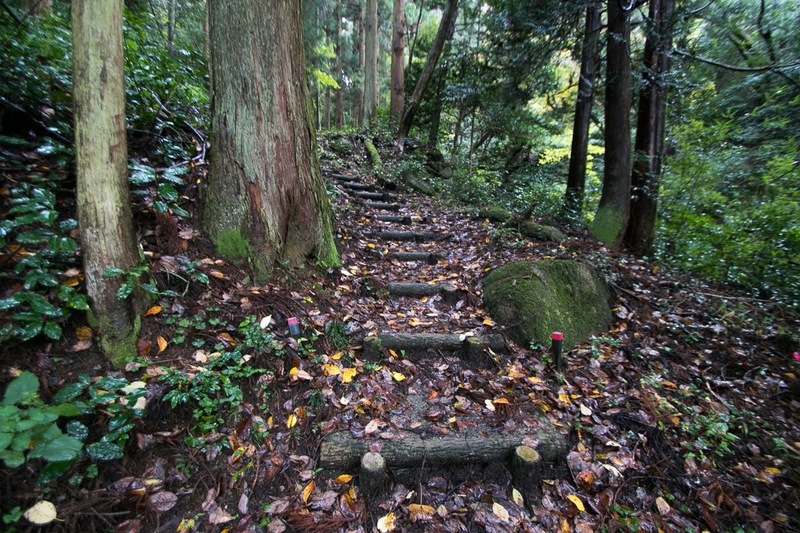 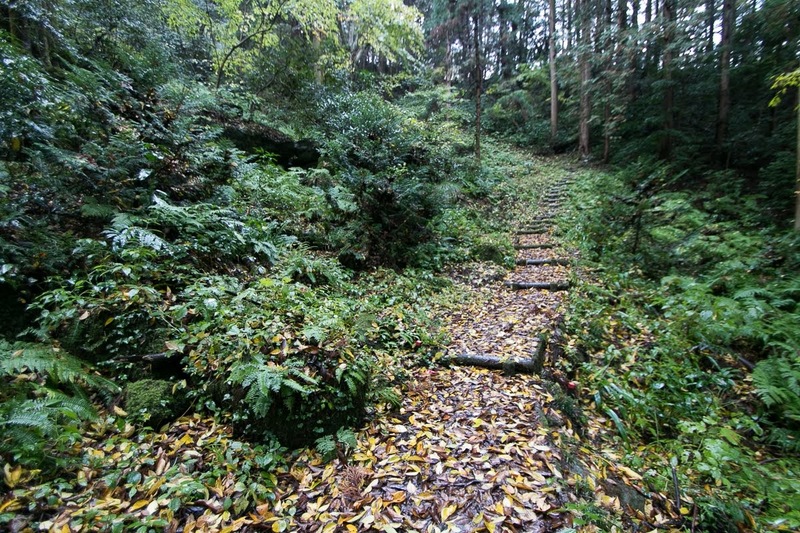 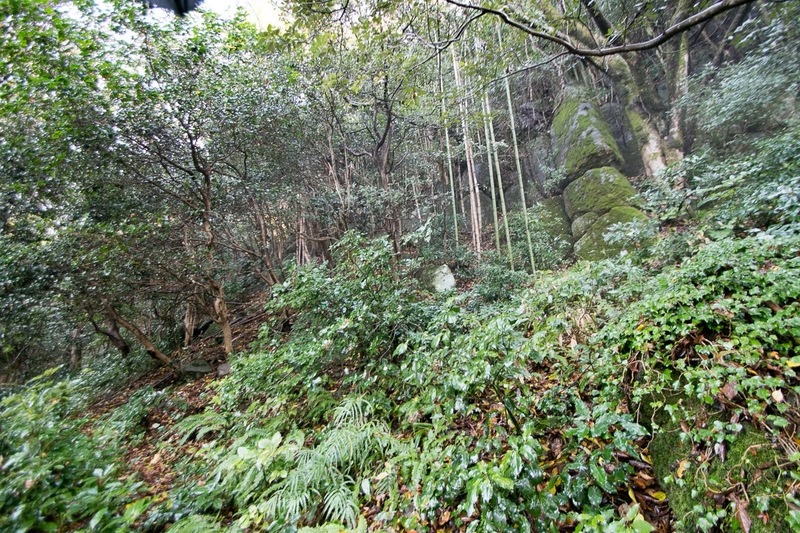 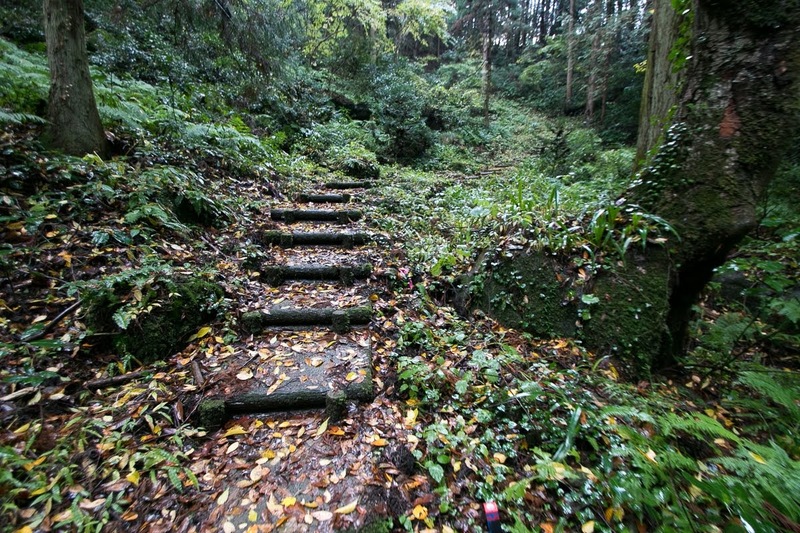 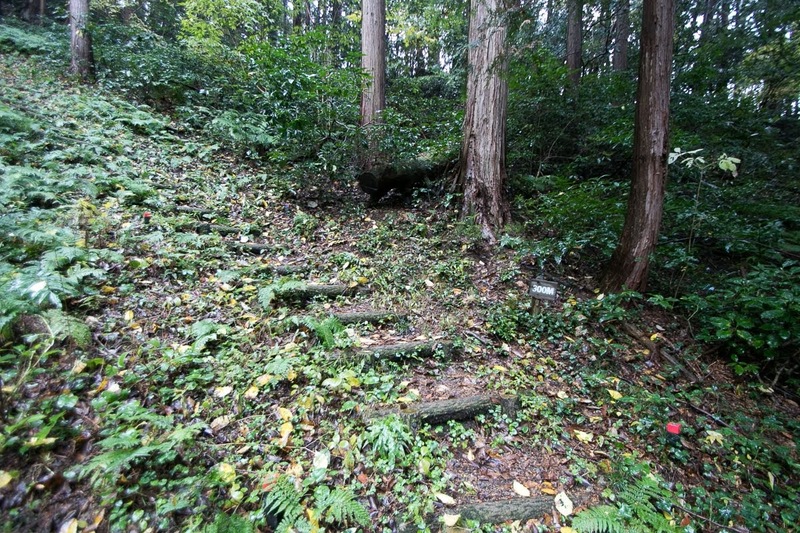 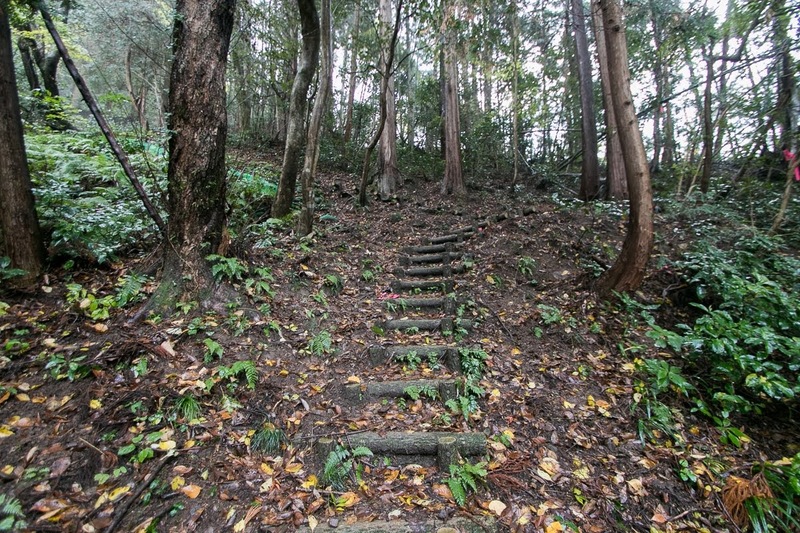 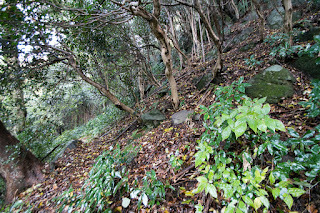 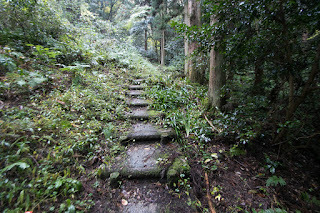 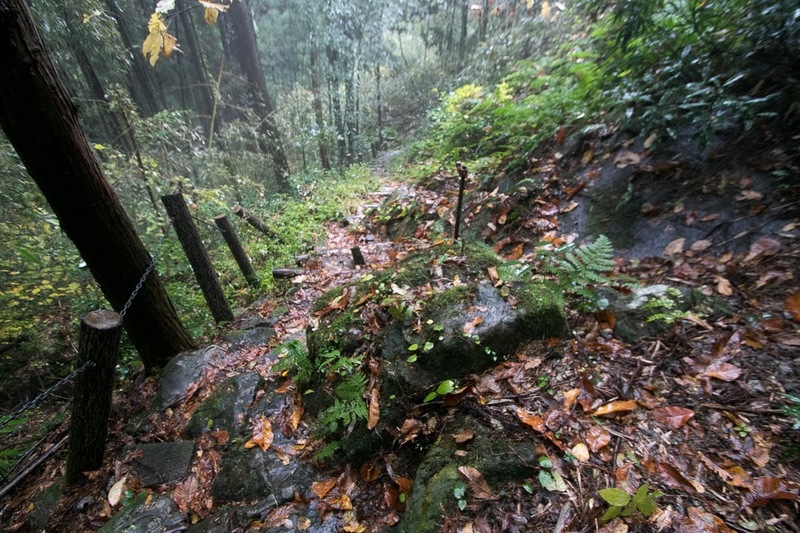 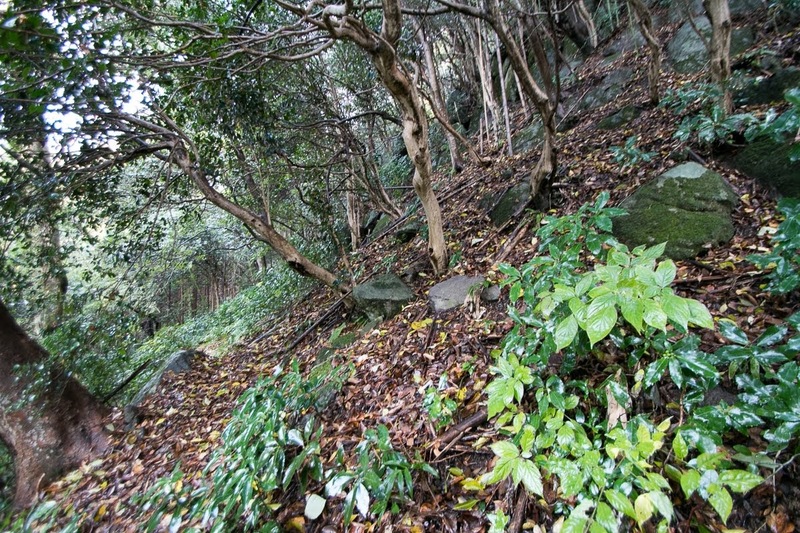 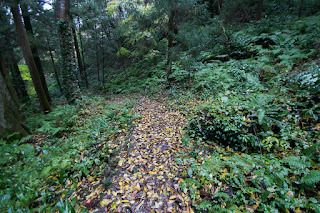 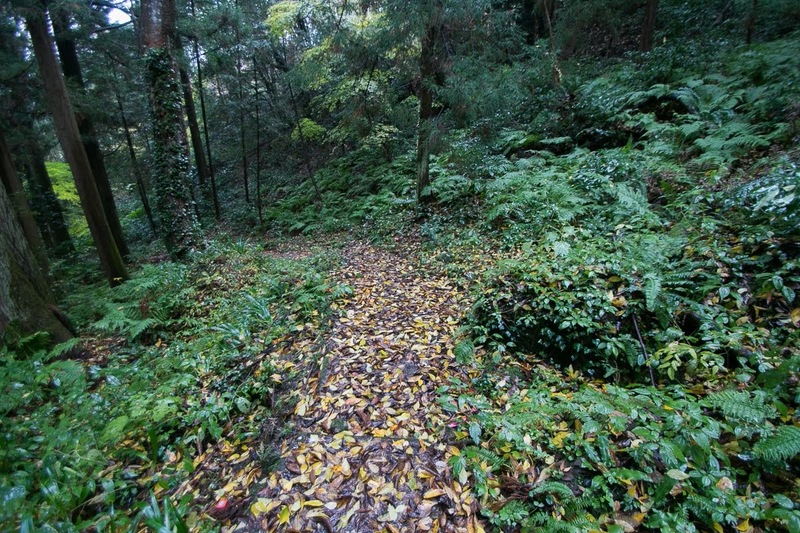 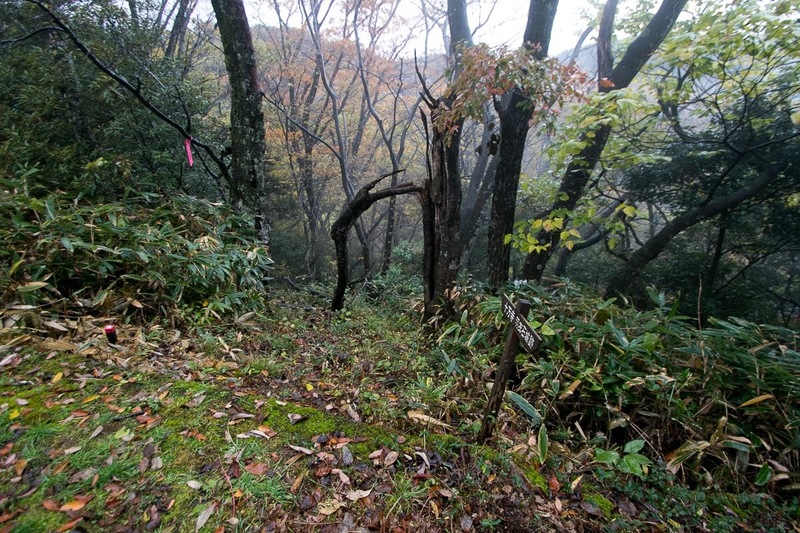 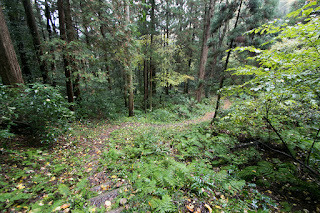 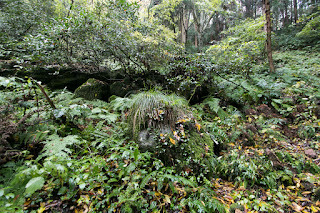 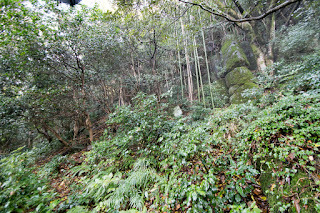 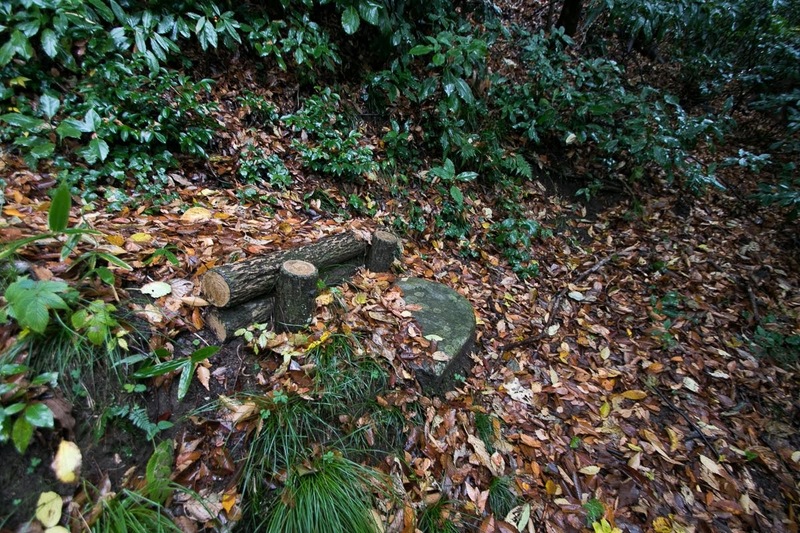 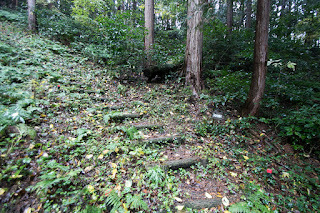 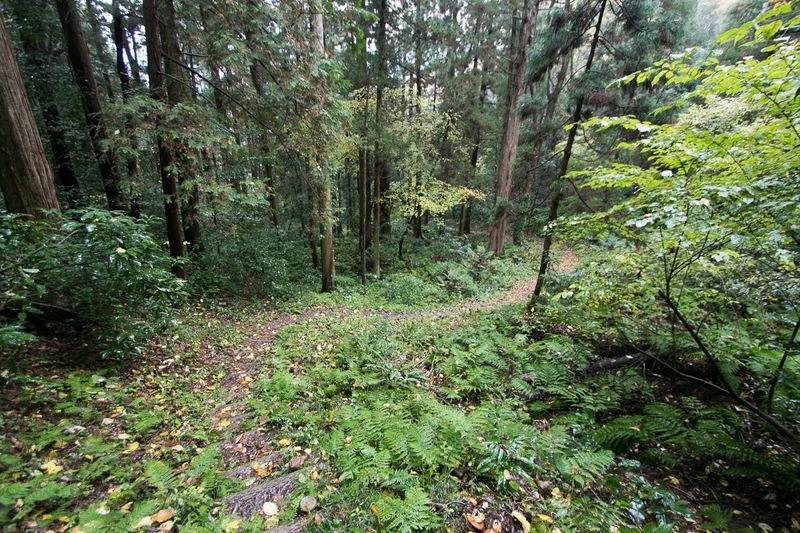 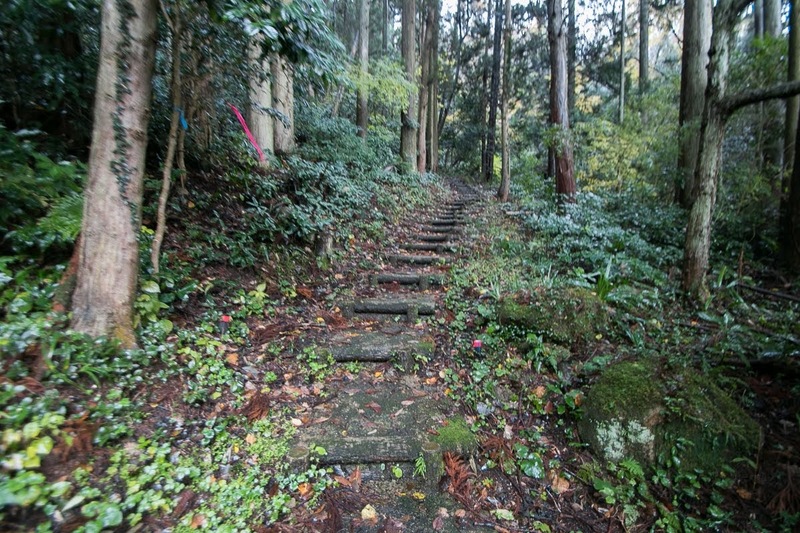 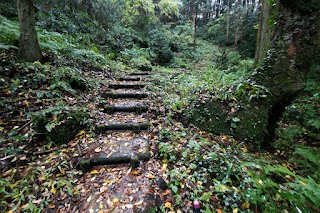 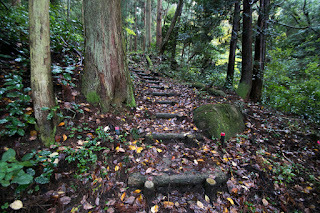 Being decorated by deep forests and huge rocks, the site of the castle still has a mystic atmosphere which matches the legend of heavenly maiden. 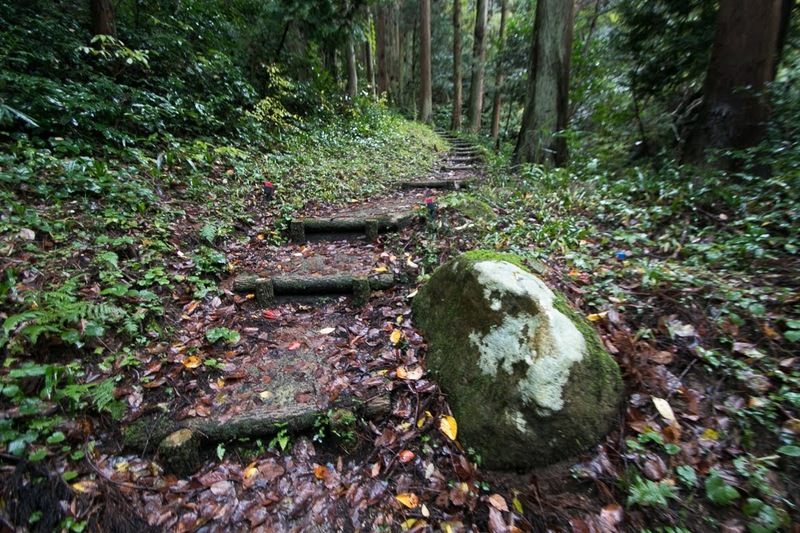 40 minutes drive from Tottori city via Route 9 to the south of Lake Togo.